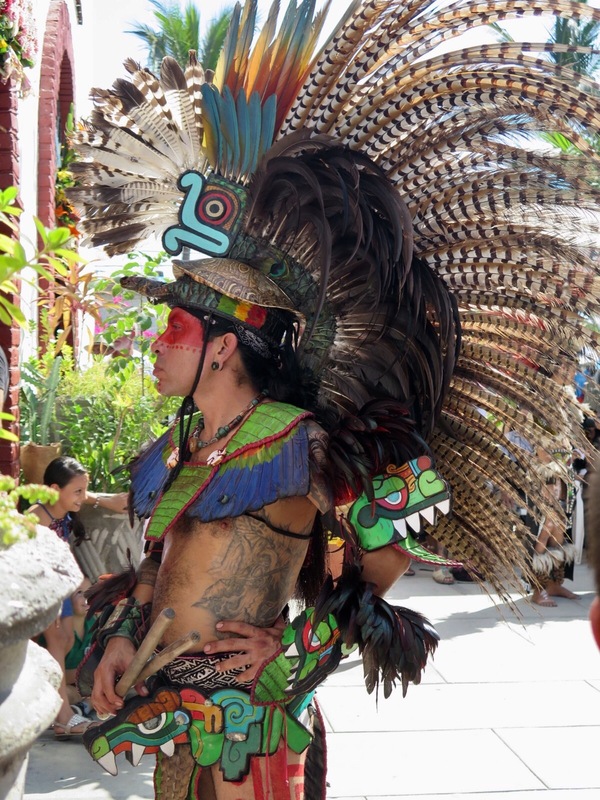 After our crossing from Mazatlan to La Paz, our time spent in La Paz was relatively short. 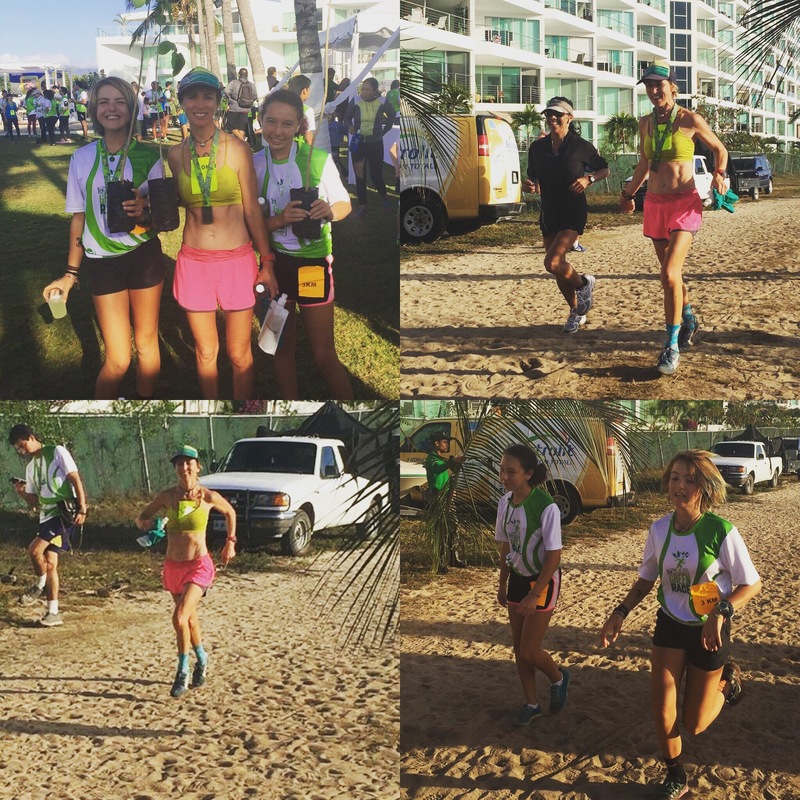 It was time to start making our way up, up, and away from the hurricanes before the hurricane season (June – November). We’d planned on staying there as long as it took for me to do all of the online and other required work for my next travel nursing assignment during the summer. A few days of wifi at the Big Sur coffee shop was all I really needed and a day to re-provision. 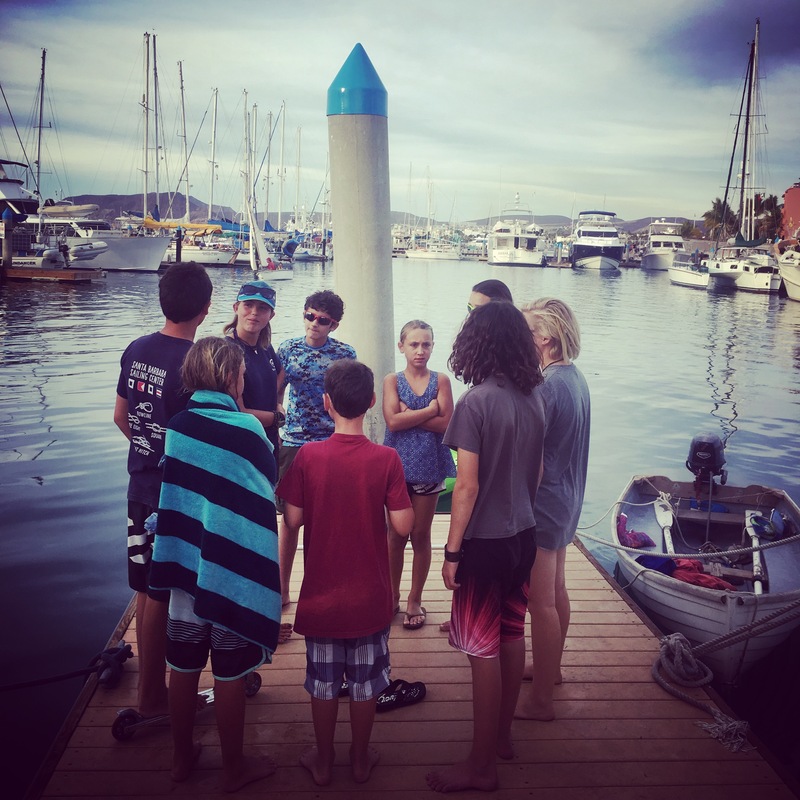 We got a little waylaid with celebrating Mike’s (SV Easy) Birthday and meeting a new kid boat called SV Secret Water. There were a few other boats we wanted to visit with too (SV Tribe, Waponi Woo, Orion, Bertie, Adventurer, just to name a few). Oh the sailing social life and how it ALWAYS makes you change your “plans”. Taj fearlessly jumping off the piling. 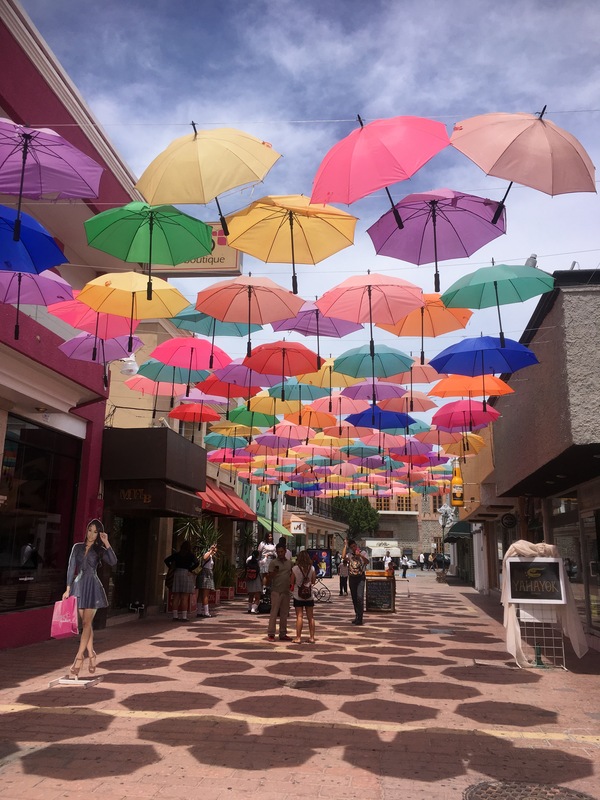 “new kids on the dock” Umbrella movement in La Paz. 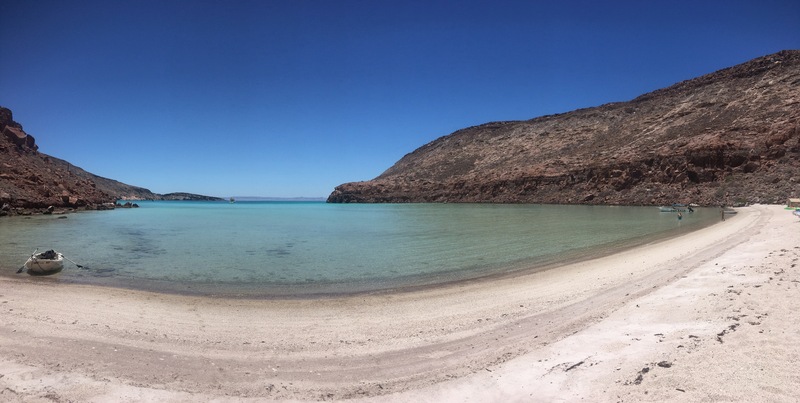 By our 5th day in La Paz we felt the itch to continue on, but the pull to stay. I think this will be a common feeling as we continue to sail the world and meet amazing people in amazing places. Alas, we chose to leave with a “see ya later” instead of a “good-bye”. 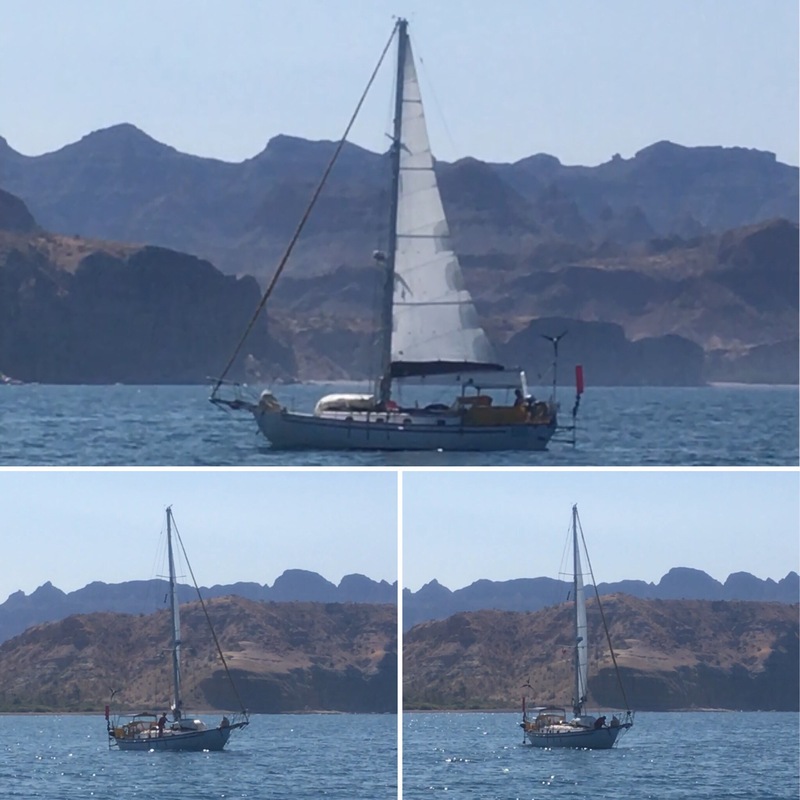 The first week of making our way north, up the Sea of Cortez was faster than our journey up last season. Now that I had work lined up with pre-work classes and assessments schedule in San Diego for June 23, we had somewhat of a time schedule. Mike on SV Easy continued to buddy boat with us. 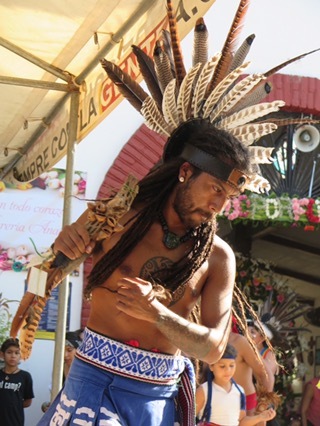 He had already been up to Puerto Enscondido as well, so he was onboard with shorter stops up to that point. Our stops were indeed brief, depending on the wind and water conditions. 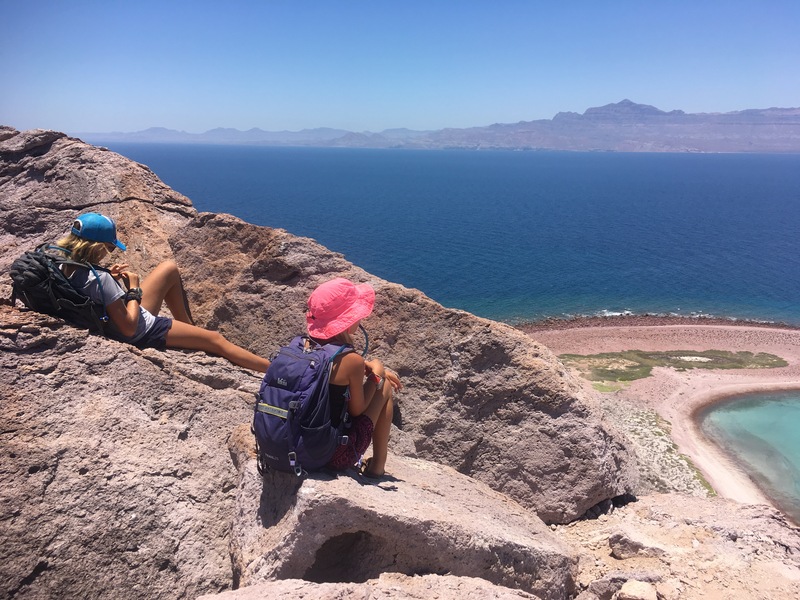 If there were anchorages or animals we hadn’t seen, we’d take some time exploring, but otherwise we didn’t lag too much until we got up to Bahia de Conception. 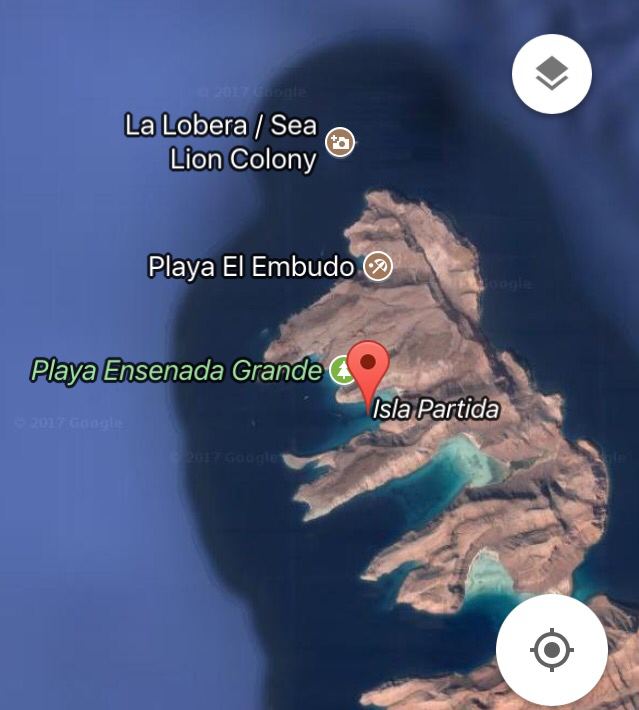 First stop, Isla Espirito Santo/Isla Partida. 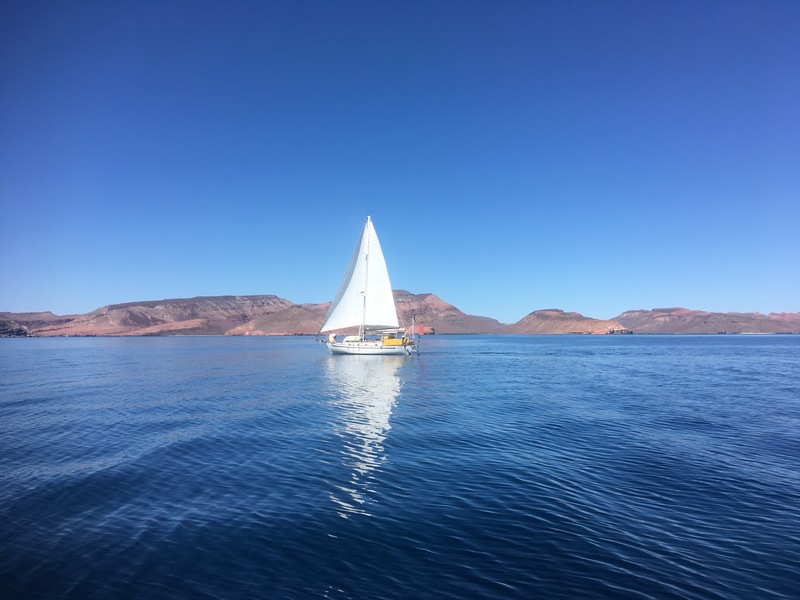 We sailed all but an hour of our 10 hour day to Bahia Ensenada Grande. 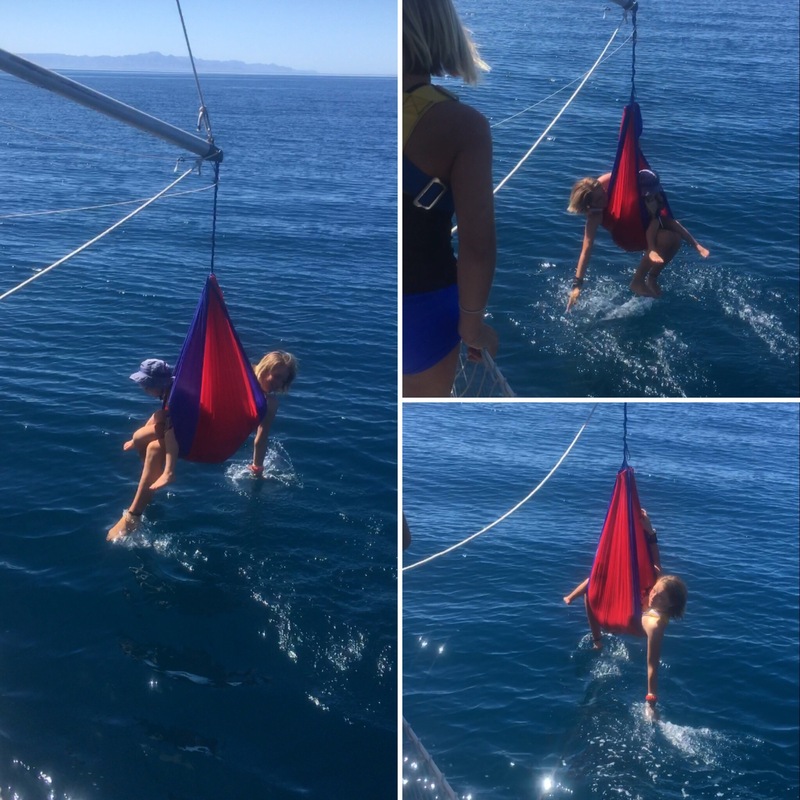 We got out the hammock for a swing and dip in the water while we were becalmed, waiting for wind. 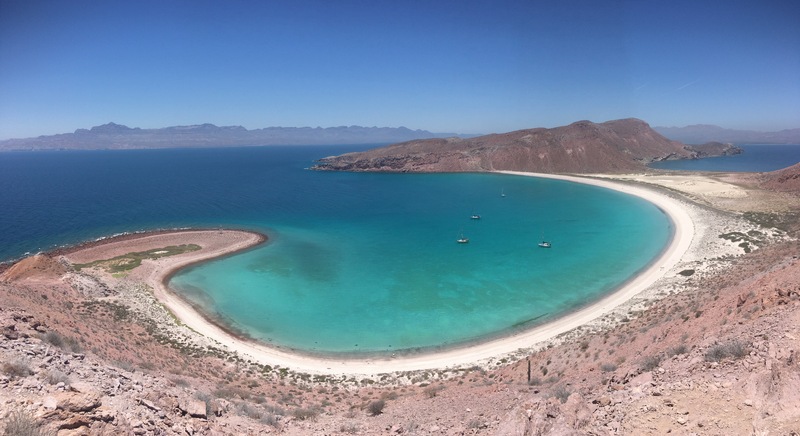 The anchorage at Ensenada Grande was spectacular! There we five boats after Easy and Shawnigan had anchored. The Mobula Rays, jumping everywhere, sounded like we were in the midst of a pirate ship battle field. 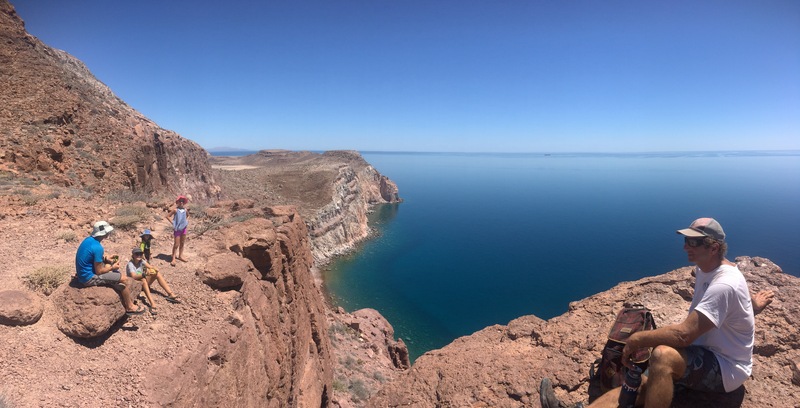 The slaps and splashes from their jumping dance of courtship, feeding, or communication surrounded and echoed off the steep burnt red sandstone and sedimentary cliffs of the anchorage. 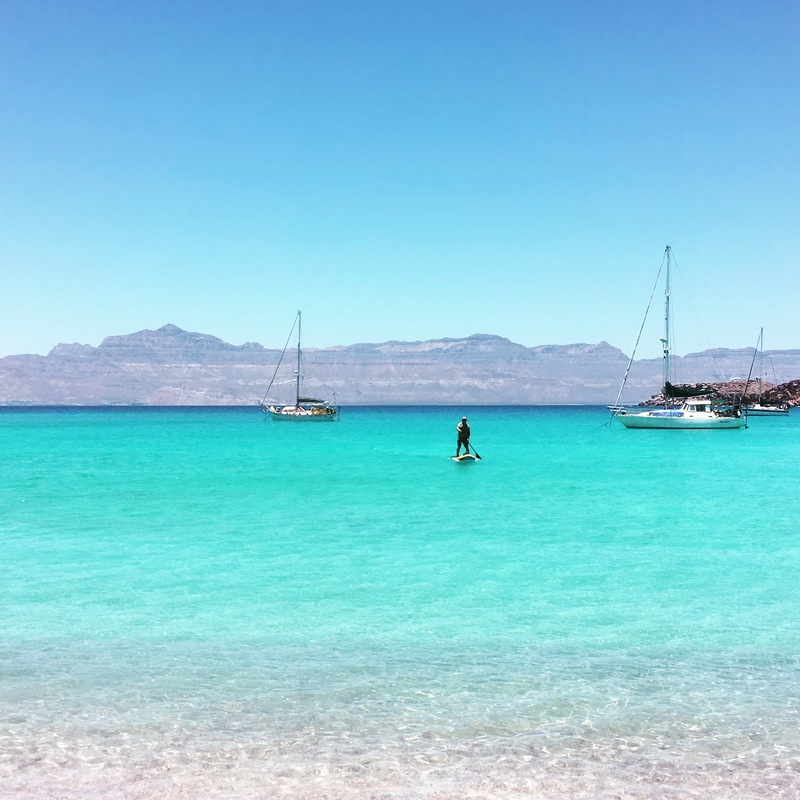 This was the moment that we felt the magic of the Sea of Cortez return. After a relaxing morning aboard, with an abbreviated boat-school day, we took a fieldtrip to hike across the island to the other side. 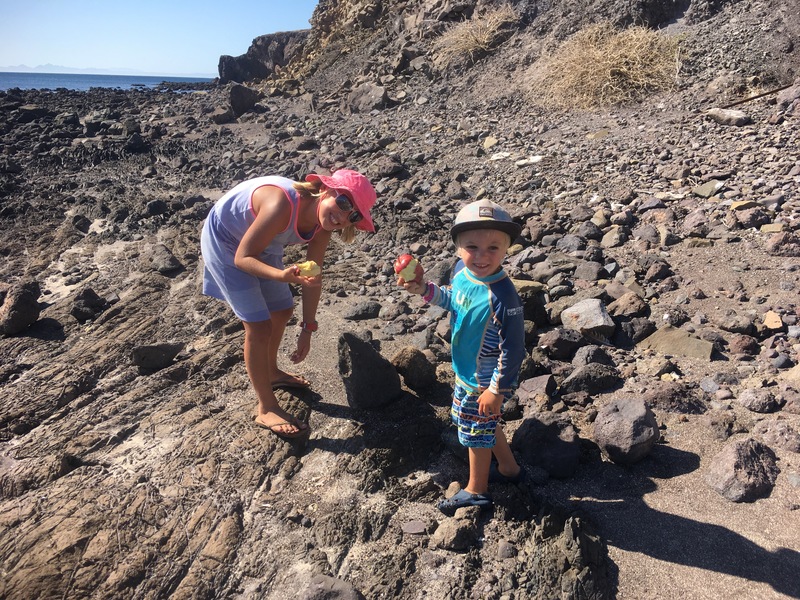 Along the way we explored the many different geological features the island had to offer. Various igneous, metamorphic, sedimentary formations all in one place! It was perfect timing for Ellamae’s science block of her curriculum. 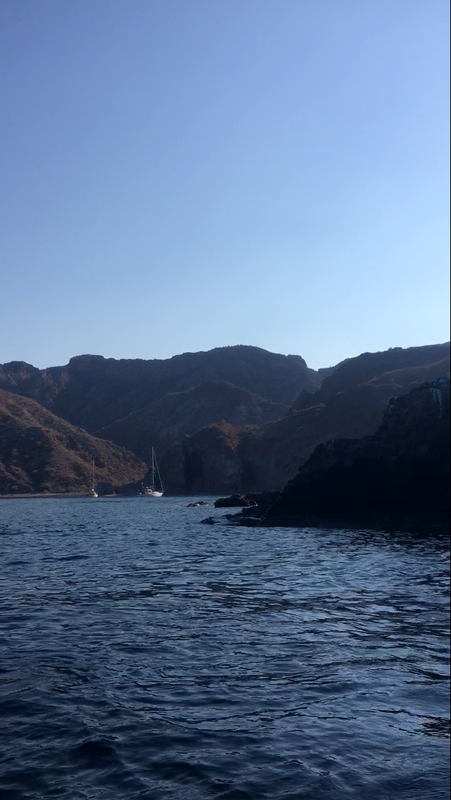 Two nights at Ensenada Grande and we were off to Isla San Francisquito, but first a quick swim with the sea lions at Los Islotes before the wind picked up. 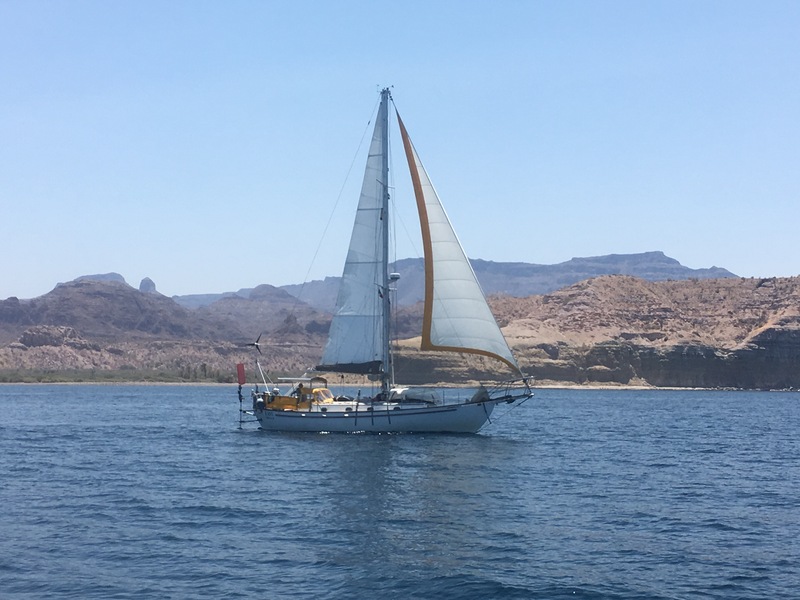 We anchored in the southwest side of the island in 58 feet of water with just enough scope for a few ohour “lunch stop”. SV Easy anchored just behind us. We new our window for swimming would be narrow before the wind picked up, so we made sure to be ready to play and ready to leave. The visibility was not the greatest and the sea lions were not in their most playful state, but we did get to swim and play around with them for a while. 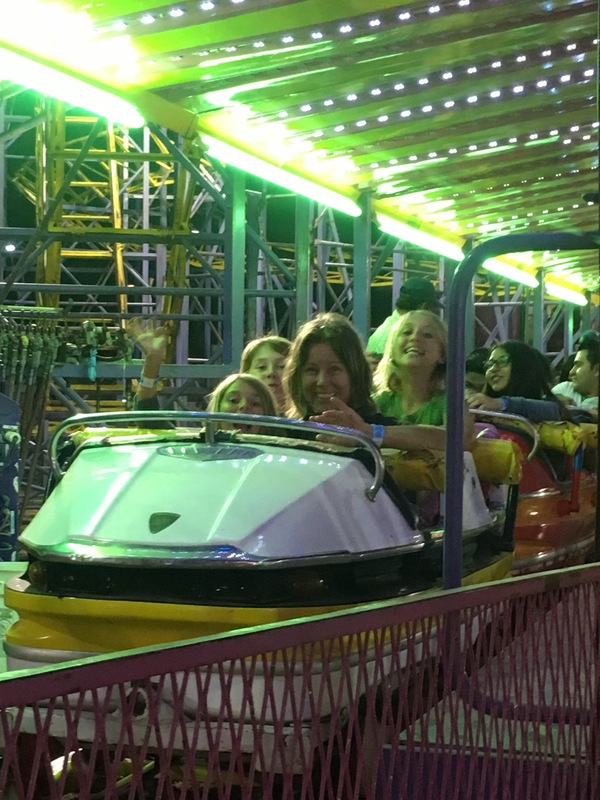 The kids had a blast! To watch their excitement and comfortable interaction with the sea lions was priceless. As we predicted, the wind filled in after 1.5 hours of being there. 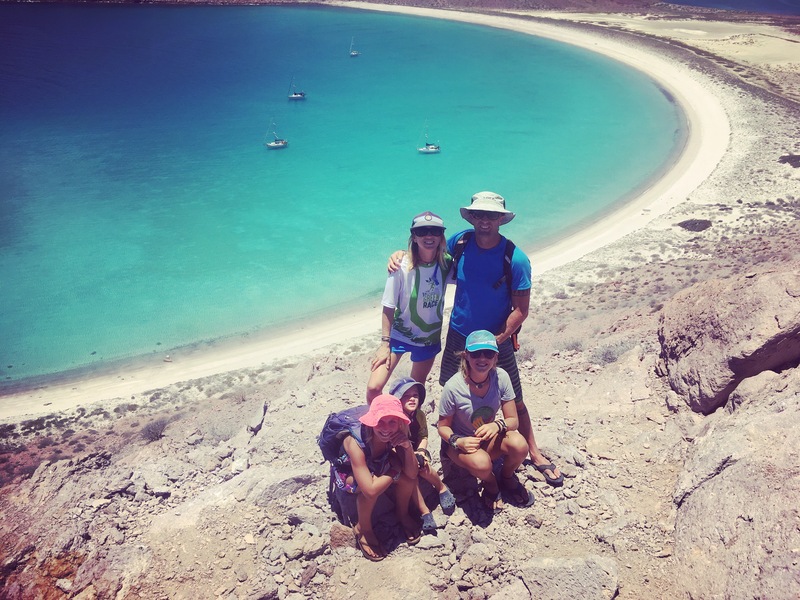 We quickly rowed back to the boat and sailed off to Isla San Francisco (Francisquito). Me, Josie, bliss. Taj and the 3 Sea Lions. Nina looking down at me with camera in hand and the Sea Lion. 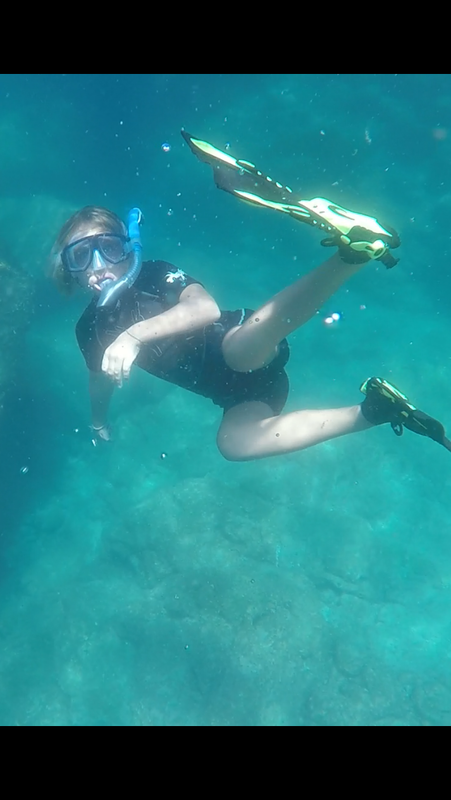 Ellamae (9) about 8 feet down, looking for sea lions to swim with, relaxed and in her element. Isla San Francisco was just as pristine as it was the previous year. The white sandy beach surrounded by crystal clear azure water makes this anchorage most picturesque. We stayed two nights here in order to hike to the top of the hill and to spear fish. Taj caught some fish himself, just off the boat with a fishing pole. 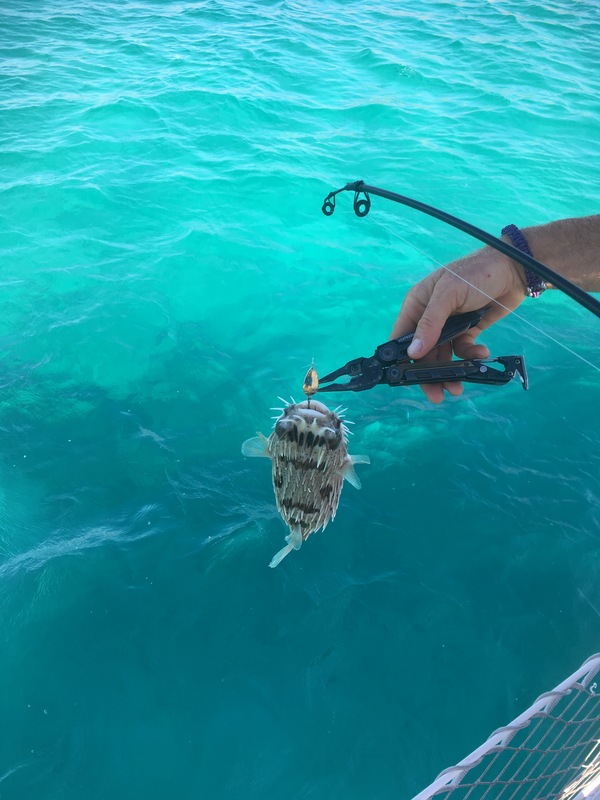 Mostly catch and release puffer fish, but he did manage to catch a trigger fish. Yummy Grouper Mike, paddling to shore. Nina And Ellamae beat us to the top. Mike looking ahead at the steep incline toward to top. Christian with Taj on his shoulders not far behind. 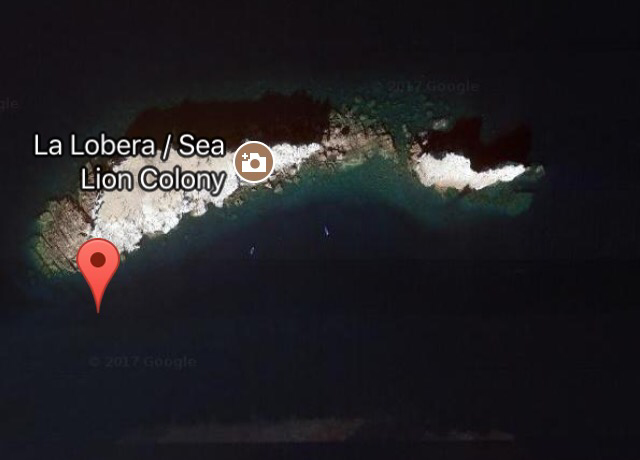 From Isla San Francisco we sailed straight to Punta San Telmo (2519.866 N, -11057.684 W) . The anchorage more of your “roadside anchorage”, but it did offer enough protection from the south south westerly winds. 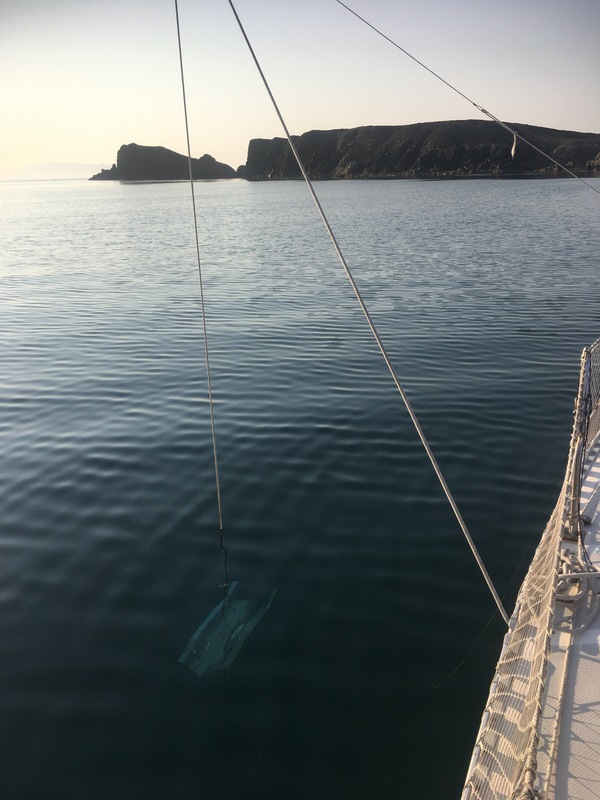 Mike did an awesome job setting his anchor under sail for the first time. This wasn’t the only “first time” among us, we finally busted out the flopper stopper for the first time. We were getting quite of a wrap around swell from the south. Mike already had his flopper stopper out within an hour of anchoring. He was rocking notably much less than we were. I somehow finally convinced Christian to set up the Magma flopper stopper. It came with our boat when we bought it in 2012, but we had never used it. As we sat anchored much more comfortably, we both laughed and agreed that we shouldn’t have waited so long. We hiked on shore a bit and settled in for a nice evening in an empty anchorage. 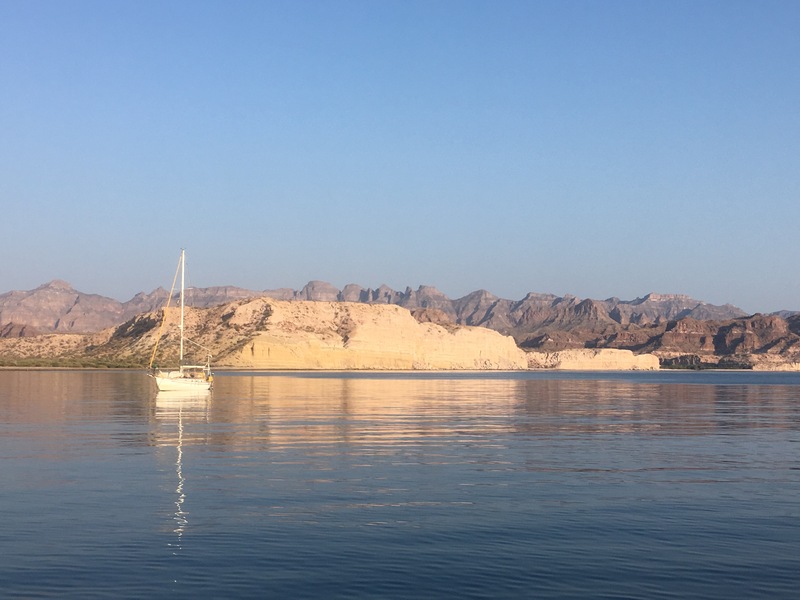 Not too long after a lovely sunrise, we set sail for Bahia San Marte. 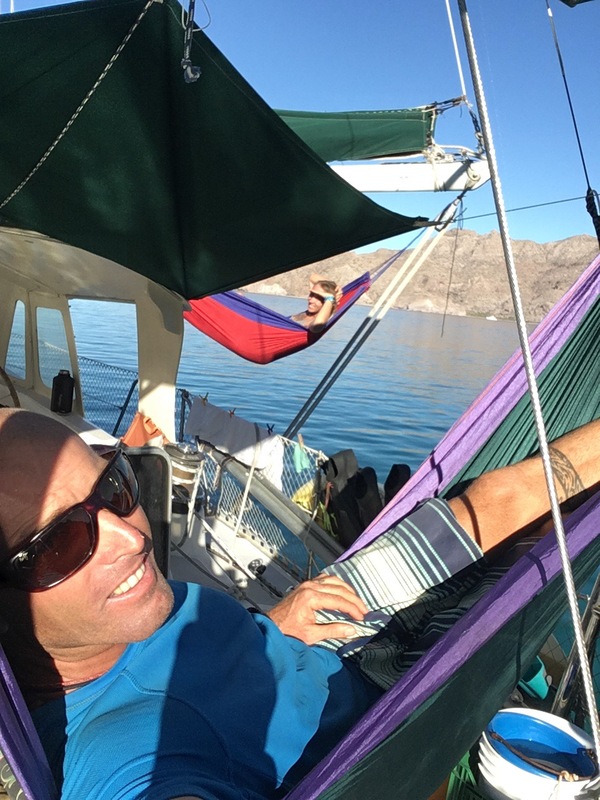 S/V Easy sailing off the hook! Bahia San Marte was pretty sweet. We sailed off and back on the hook, as did Mike. The cliffs that surrounded us were majestic. 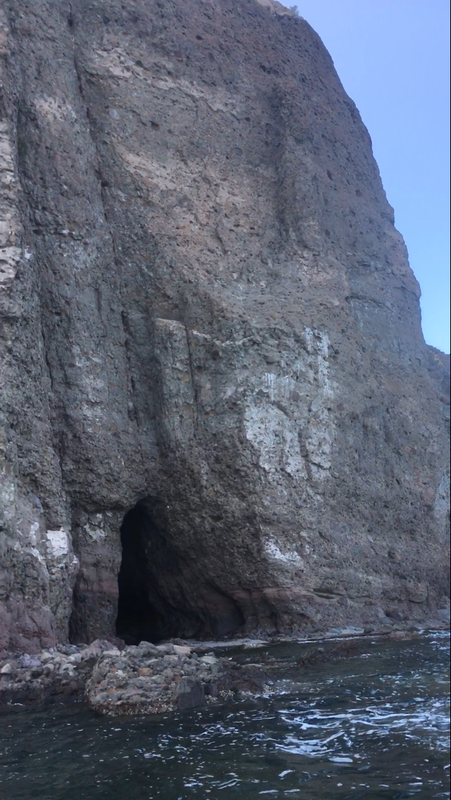 The cliffs looked rock climbable (hint to anyone looking for new amazing places to climb). 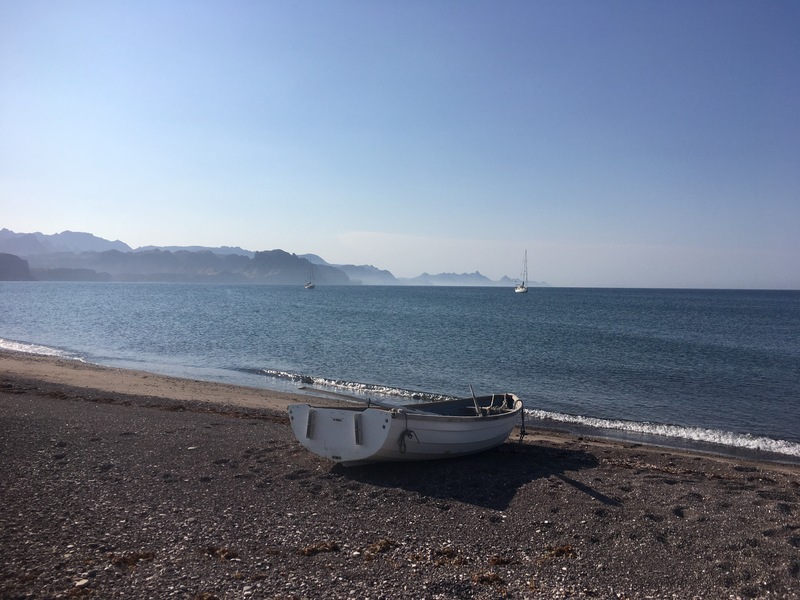 Mike took his paddle board and we rowed the dinghy over to them to check out a cave that was highly recommended in the Shawn and Heather Sea of Cortez: A Cruiser’s Guidebook. It was pretty cool. 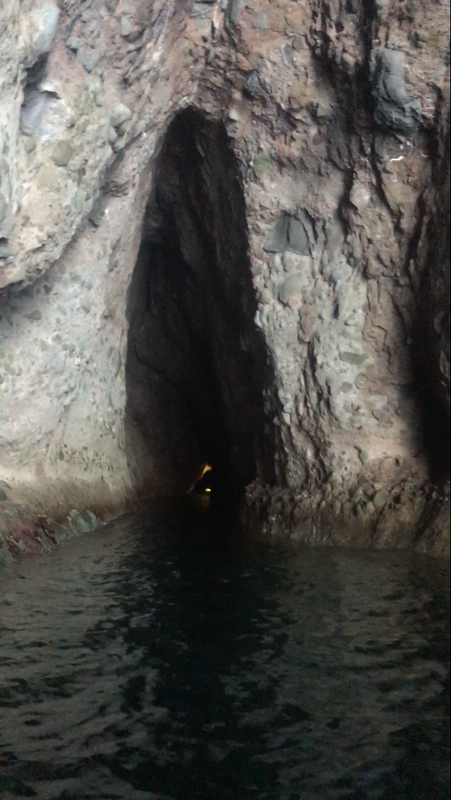 This was just the beginning of Baja’s cave exploring for the crew aboard SV Shawnigan. 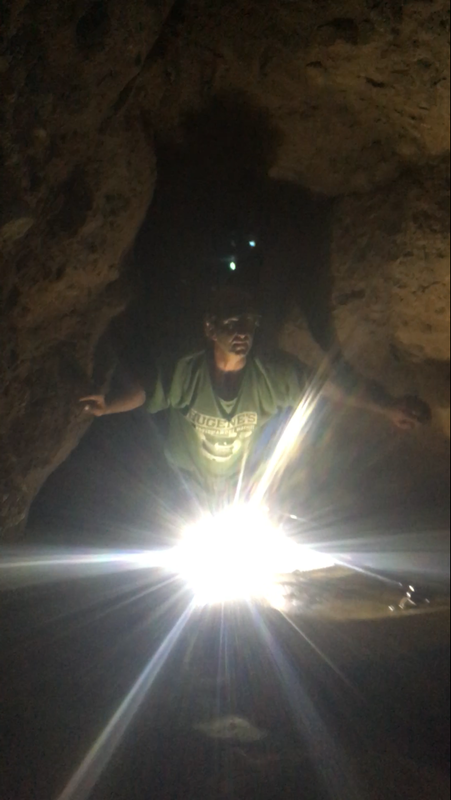 Mike making is way back from the very back of the cave. 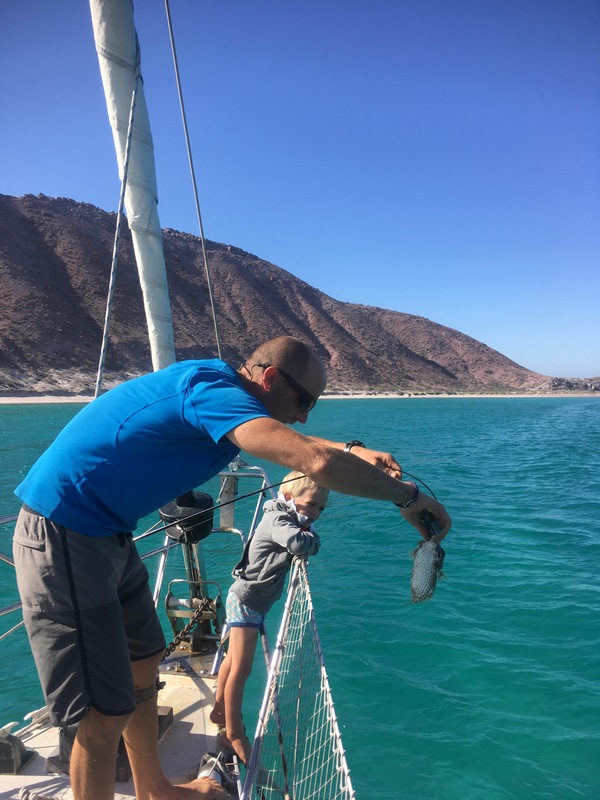 The next day we sailed off and back on the hook again to Agua Verde. One of our favorite places so far, in large part due to the quaint village where you can restock on some provisions as well as purchase fresh goat milk (seasonal) and goat cheese directly out of the farmer’s house. 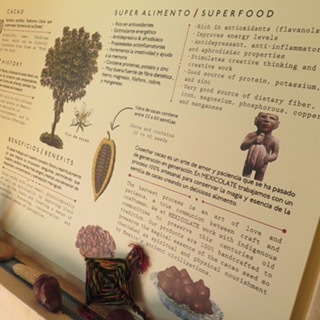 The local tienda, or little store, offers fresh fruit and veggies and other essentials. They rearranged it since the last time we were there to hold more products. Everyone in the village was very welcoming. Side note, there are petroglyphs in the area that was visited last year, but we didn’t this time around. See our post from last year for details here. As per usual with our anchorage visits, we swam around to cool down and discover the underwater ecosystem around us. 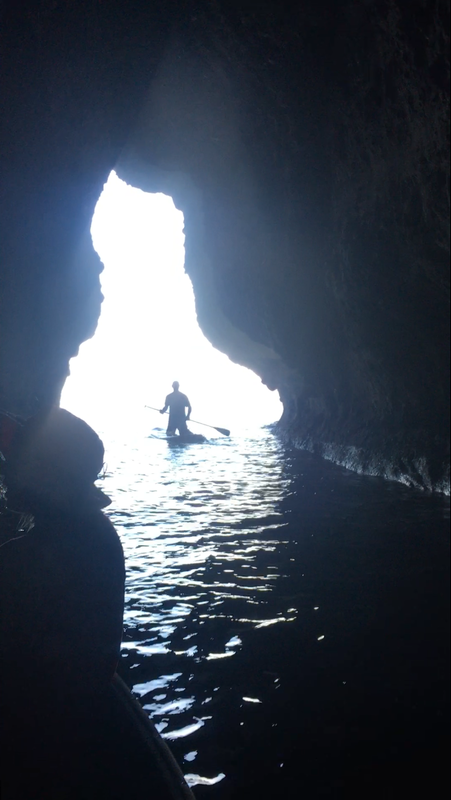 We found a little underwater cave/arch with sea fans and beautiful light. Nina and I dove through first and with time, Ellamae dove through her first underwater tunnel! The same day, Taj dove down to 10 feet! Our kids are turning in to fish! 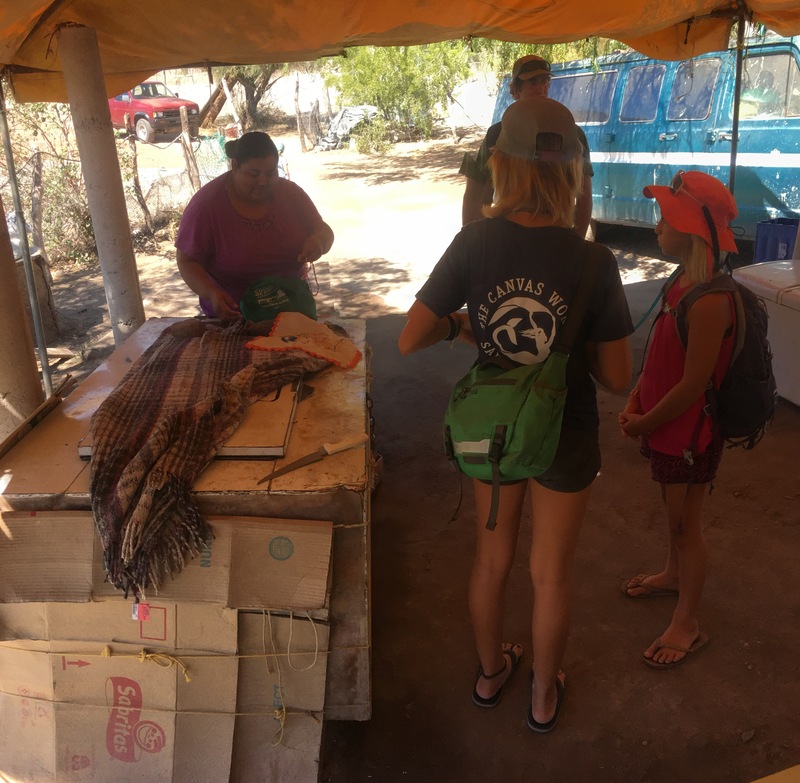 Shopping at the local tienda in Agua Verde. 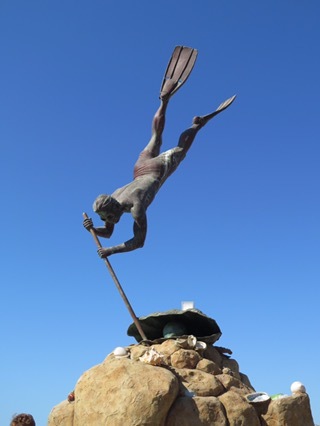 Taj on his 10 foot dive. Relaxing in the cockpit after a swim. Taj on his kayak in Agua Verde. Isla Monserrate was calling our name. We hadn’t been there before, the wind at the time wasn’t unfavorable, so why not? The sail there was great. 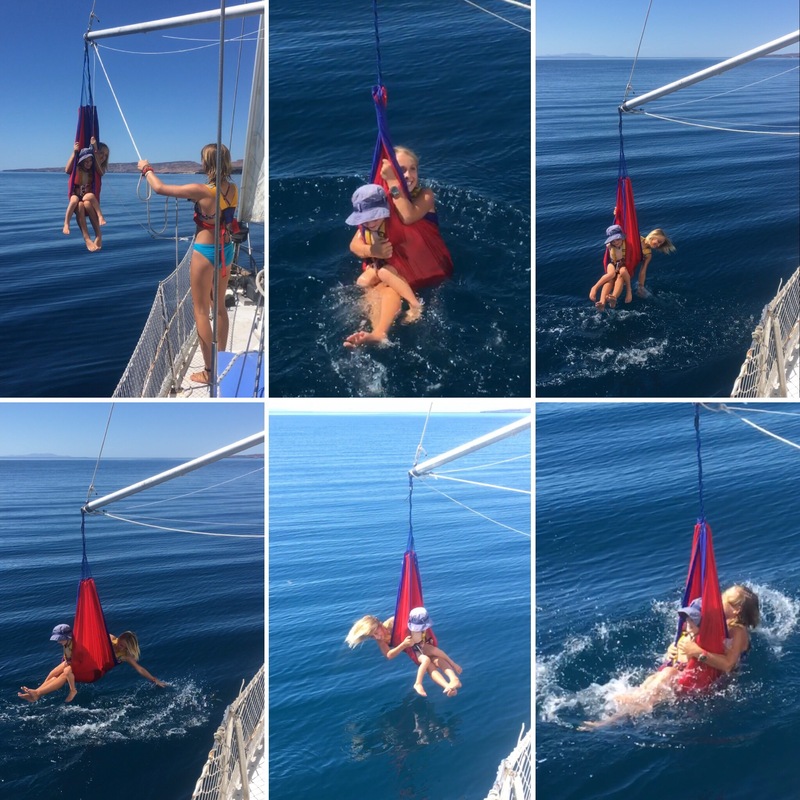 We were in the swing of anchoring under sail, so we did it whenever we could. Mike was getting in the groove of it as well. We settled into the anchorage in time for lunch. 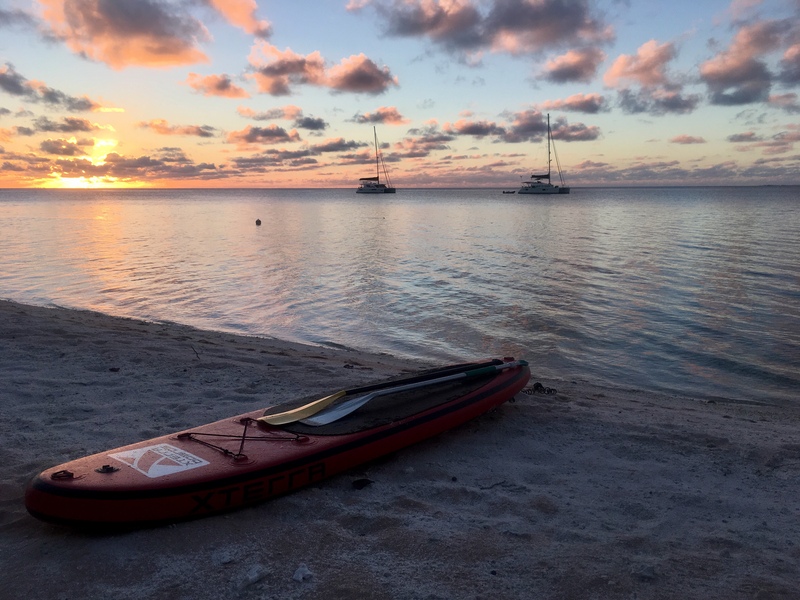 Christian was having a bout of low energy, crummy feeling from his Lyme disease, so I took Ellamae and Taj to shore to explore along with Mike while Nina stayed onboard with Christian. The wind picked up more than we were hoping for that evening. 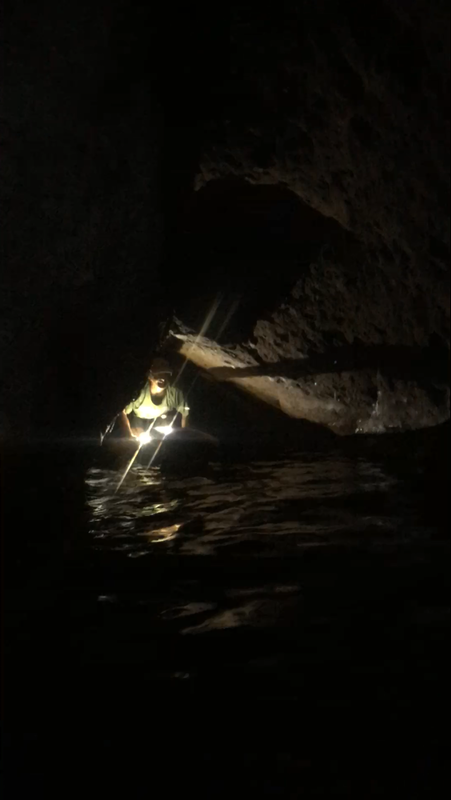 It was offshore, but it put a damper on exploring the underwater realm. Our 2 boats, Easy and Shawnigan, sitting pretty in the deserted anchorage. Thankfully the next morning, Christian woke up feeling better. 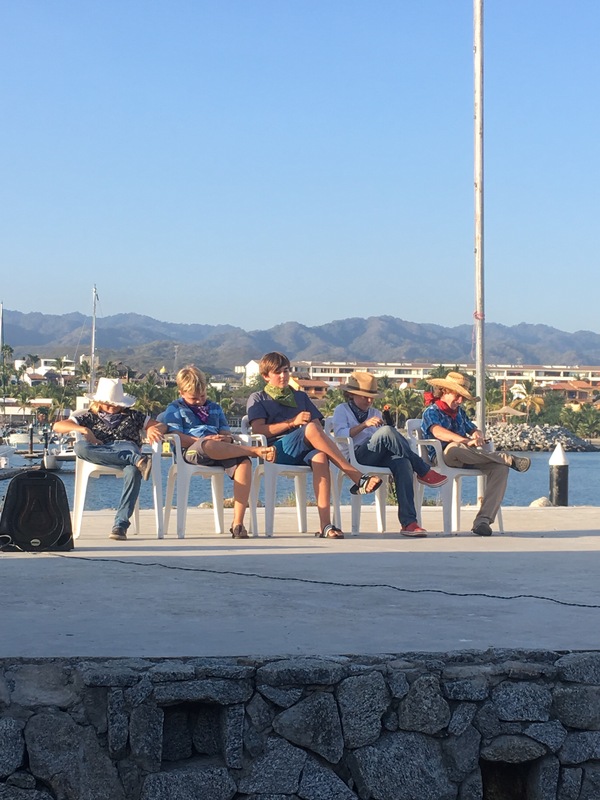 We set for a 10 mile sail for Bahia Candeleros. Another great day of sailing off and back on to the hook. 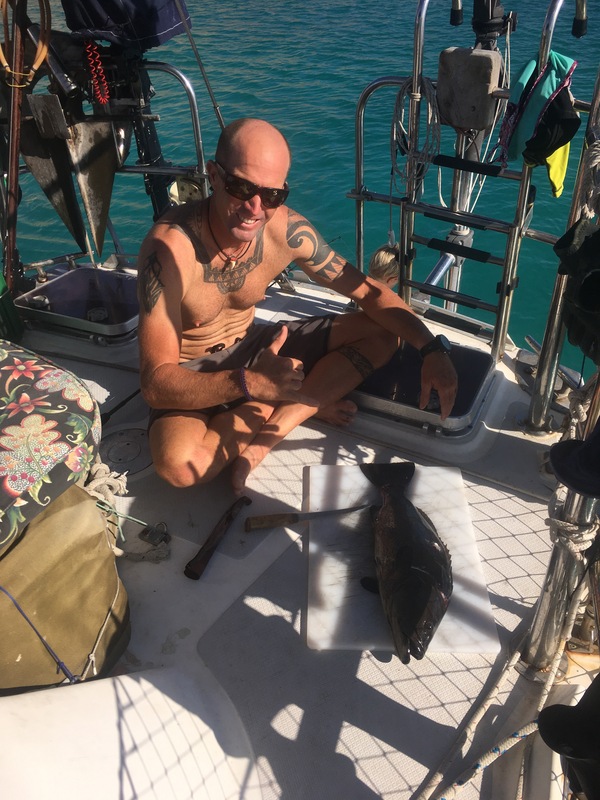 We found ourselves anchoring in Candeleros with only a few with other boats, one of which was our friend John on SV Summer. 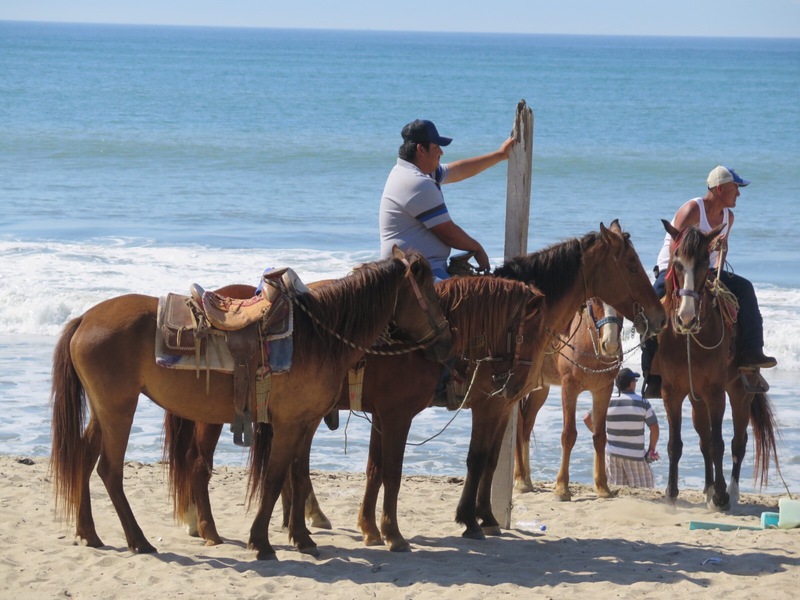 Candeleros is known for its beachfront resort with day passes and wifi access. Word on the street says that they have gotten progressively uptight about letting cruisers come in and use the facilities. We chose to bypass these amenities this year. Truth be told, even if we wanted to partake in the resort luxuries, the wind was howling out of the west and straight into the anchorage. Needless to say, we were not leaving the boat for any reason, except to swim when there was not any wind during the early daytime hours. In the morning, we did snorkel. The water was quite chilly, about 68F. The visibility was about 20 feet, so not optimal either, but we still enjoyed swimming with a huge group of the fasinating Mobula rays. 2 nights in Candeleros was enough for us this time around. 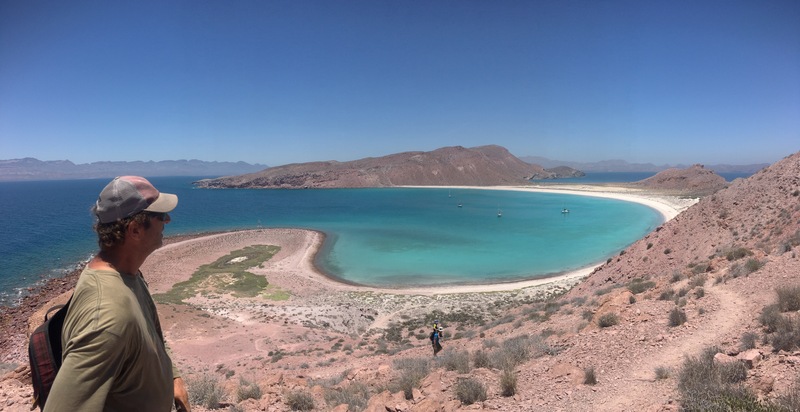 Next stop… Loreto! Overnight anchorages overview map: From top left to right: Ensenada Grande, Isla San Francisco. 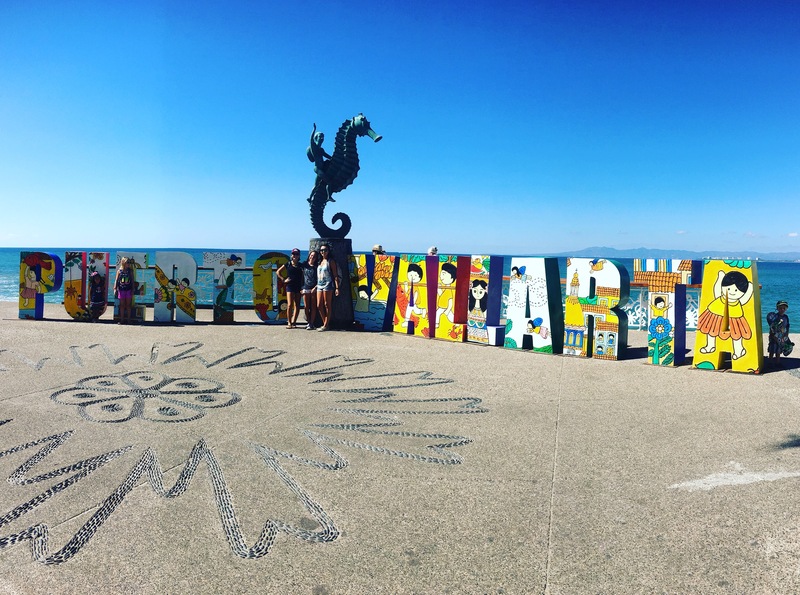 Bottom row left to right: Punta San Telmo, San Marte, Monserrate (picture above), then Candeleros. Support our Cruising Kitty, buy us a dinner out! 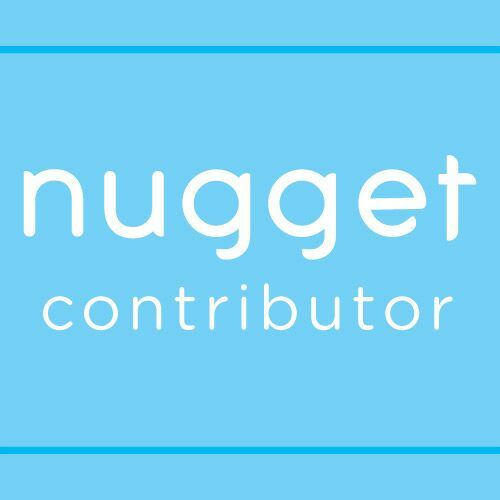 Feeling like helping fund our travels? Here’s how you can help! Donate here now and whenever you’re feeling extra generous. 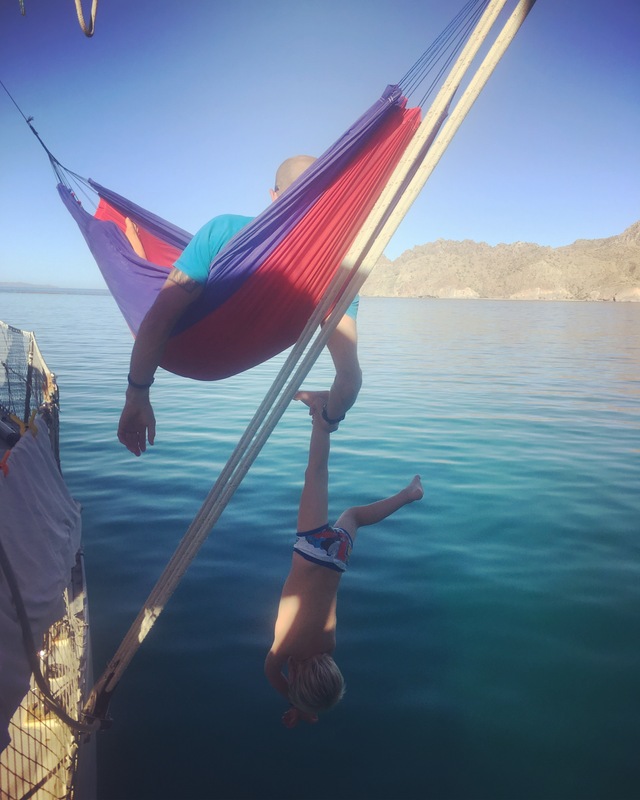 This entry was posted in Adventure, boatschooling, Boatschooling, Cruisers, cruising with kids, cruisingkids, kid boats, kids on boat, Sailing blog, sailing family, Sailing with kids, traveling family, Uncategorized, World travel and tagged #sailinstagram, adventure family, adventure with kids, afamilyafloat, Agua Verde, Agua Verde Baja, Agua Verde Cave Paintings, alternative living, anchoring under sail, Bahia Candaleros, Bahia San Marte, baja sur, big sur coffee, big sure cafe oganico, big sure coffee la paz, boat, Boat life, boat school, boat teen, boating, boatschool, cruising, cruising and travel nursing, cruising world, cutter, ensenada grande, family of 5, fitsailor wildlife, free diving kids, free diving through arches, Fresh goat cheese in Baja, fresh goat milk in Baja, hammock life, Hammock swing, Hammocks on sail boats, home school, homeschool, hurricane, hurricane season, i, isla espirito santo, Isla espiritu santo, isla monserrate, isla partida, isla san francisco, isla san francisquito, jumping off pileons, kid boat, kids 4 sail, kids for sail, kids on boats, kids on the dock, kids4sail, La Lobera, la paz, la paz marina, life sailing with kids, live aboard, los islotes, magma flopper stopper, mexico, mike jacoby, Mobula Rays, nature, oak meadow curriculum, ocean, playa ensenada grande, Punta San Telmo, rock climb baja, rock climb sea of cortez, s&s, sail, sailing, sailing across the sea of cortez, sailing adventure, sailing around the world, sailing baja, Sailing blog, sailing family, sailing life, sailing mom, sailing off the hook, sailing teen, sailing the world, sailing with 3 kids, sailing with kids, sailing with lyme disease, sailing world, san telmo, sea, sea lions near la paz, sea of cortez, Sea of cortez cruising guide, Shawn and Heather Guide, Shawn and Heather Guide to the Sea of Cortez, shawnigan, shipshape, sloop, snorkeling baja, snorkeling kids, sparkman&stephens, sparkmanandstephens, sparkmen and Stephens design, sparkmenandstephens, stevens 40, stevens40, sv adventurer, sv bertie, sv easy, sv orion, sv secret water, sv shawnigan, sv summer, sv tribe, sv waponi woo, swimming with sea lions, teens on boats, tiny house, travel nurse, travel nursing sailor, traveling family, traveling with kids, umbrella movement, umbrella nation, umbrellas in la paz, unschool, up up and away, we thrive outdoors, wethriveoutdoors, world school, World travel, worldschool on July 28, 2017 by A Family Afloat. 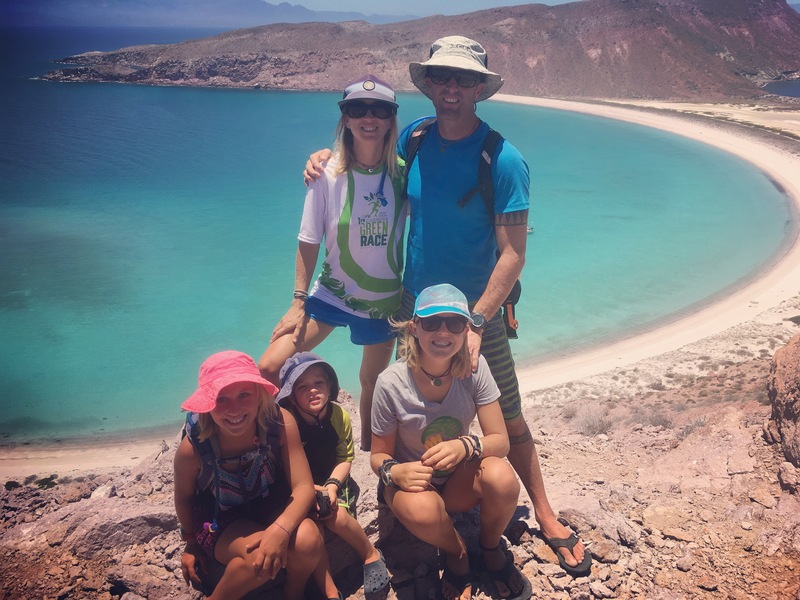 I finally uploaded our video of our time spent in La Cruz December 17, 2016 to February 17 (ish), 2017. Enjoy! Be sure to subscribe to our YouTube channel and “like” our videos! 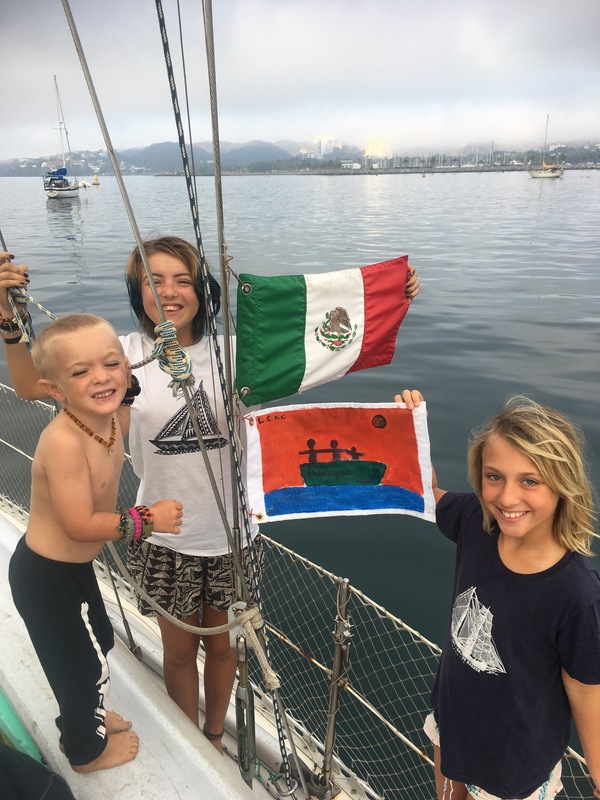 This entry was posted in sailing family and tagged a family afloat, afamilyafloat, banderas bay, blessing of the fishing fleet 2017, blessing of the fleet, boat kids, boatachool, boatlife, bucerias, bucerias orphanage, cruising kids, dental work in mexico, february 2017 mexico, homeschool, january 2017 mexico, kids on boats, la cruz, la cruz cruising kids club, la cruz kids club, marina la cruz, marina nayarit, mayan traditions, mexican bus, mexican culture, mexican orphanage, mexico dental work, puerto vallarta, sailing family, sailing life, sailing mexico, sailing with kids, sparkman&stephens, stevens40, SV August Dream II, SV Ceilydh, SV Full Monty, SV Kenta Anae, SV Luminesce, SV Mango, SV Nomi, SV Pickles, SV Princess Ericka, SV Raireva, SV Riki Tiki Tavi, sv shawnigan, SV Velella, SV Zimovia, temple if guadalupe puerto vallarta, templo de guadalupe, world school on April 8, 2017 by A Family Afloat. Christmas for the Orphanage: every Christmas season at Marina La Cruz people donate gifts for the local kids in the orphanage. 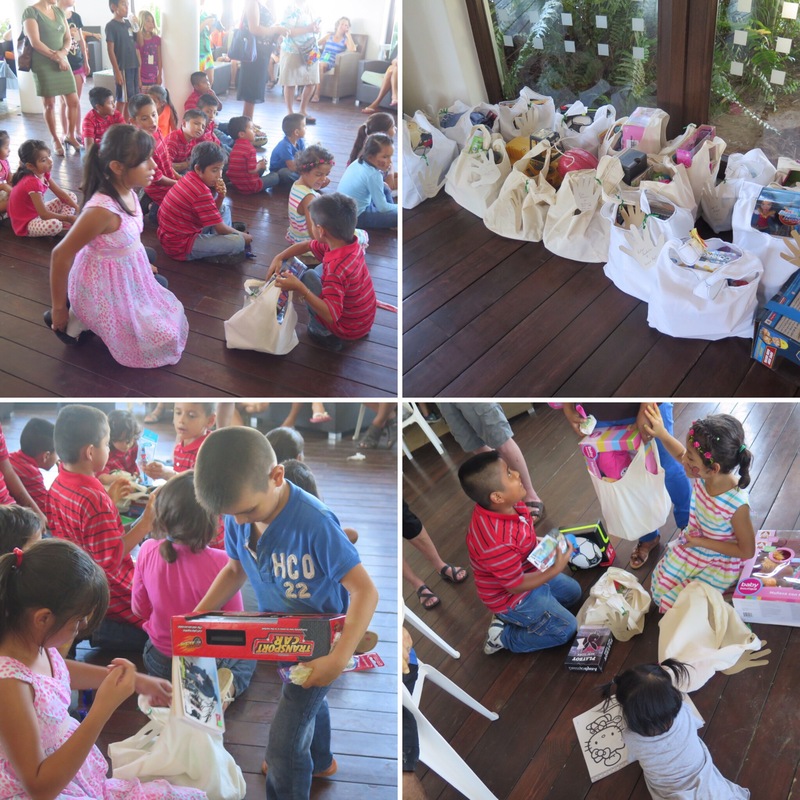 Just after the New Year, the orphans are brought to the marina to participate in activities and have gift bags handed out to them. The bags themselves were made by various other sailors and with help from PV Sailing. 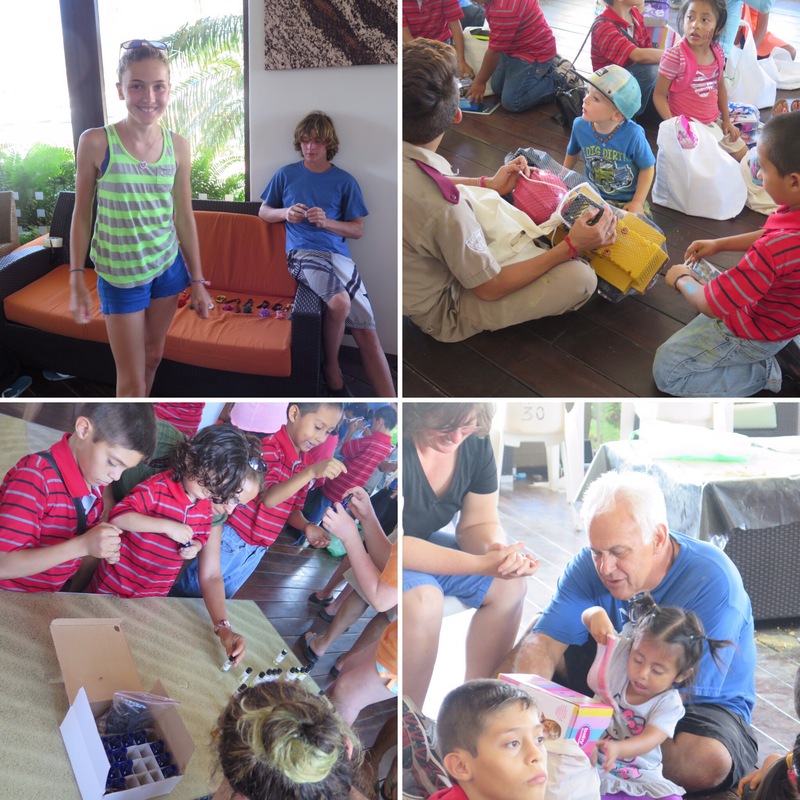 Cookies were baked by fellow sailors, and gifts were bought and wrapped specially for each kid at the orphanage. 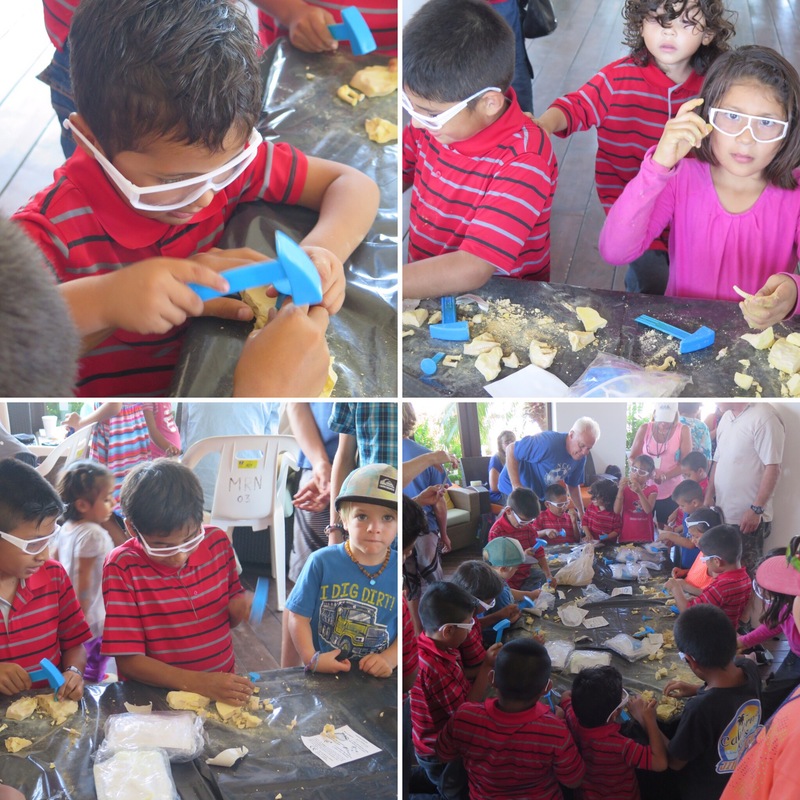 The La Cruz Cruising Kids Club set up stations for various activities, such as face painting, makeup, perfume making, friendship bracelet making, and a table full of “archeology kits”. What a joy to see all the happy faces of these beautiful children. 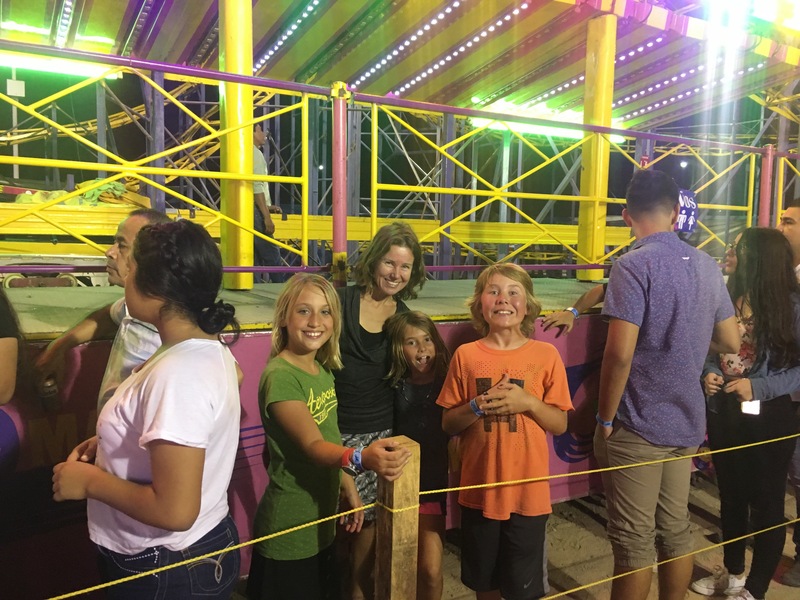 Most only spoke Spanish, so it was a great experience for our kids as well. 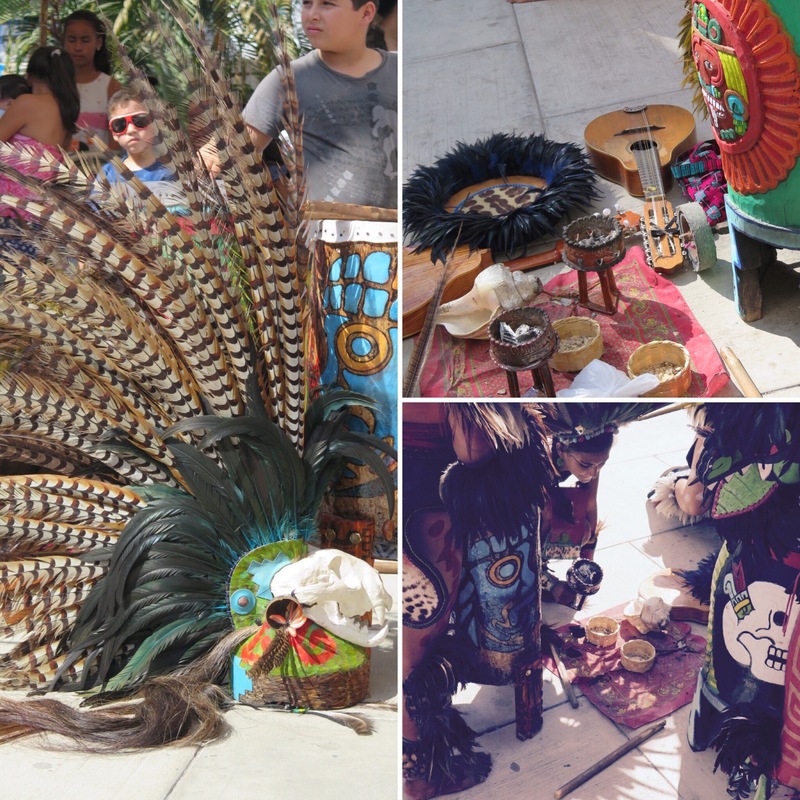 Thanks Catrina at Marina La Cruz for organizing this! 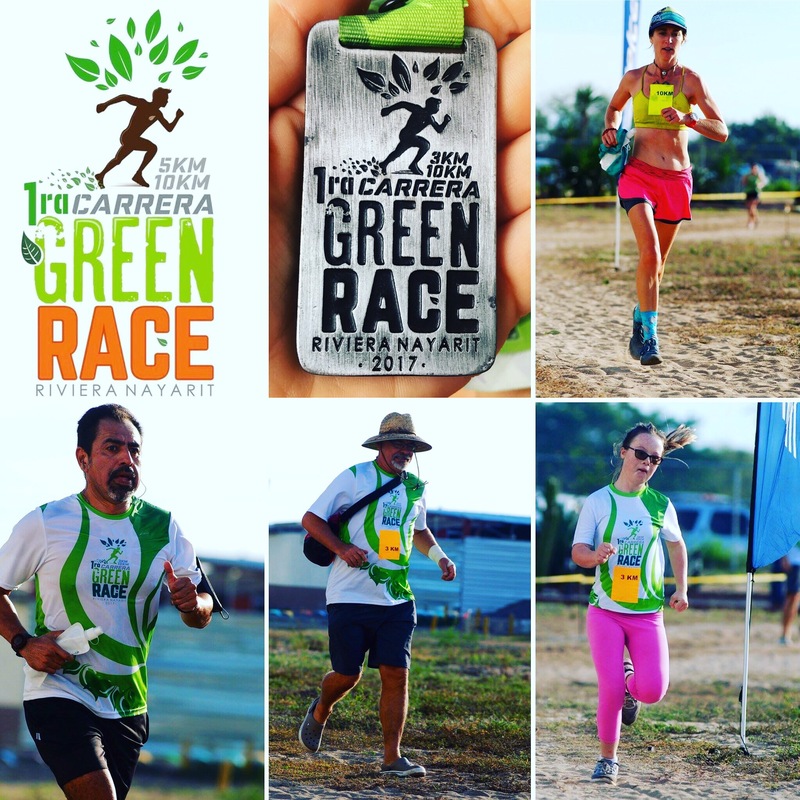 Green Race: the first annual 3k and 10k run to support planting native trees and other “green” ways of living in Mexico. 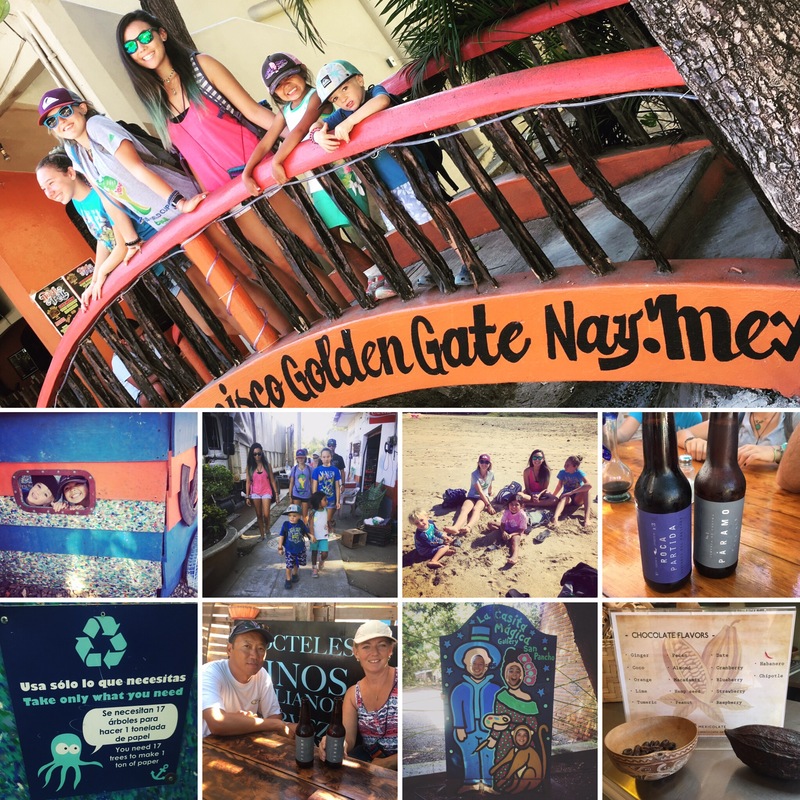 There is quite a bit of trash, but I’m impressed with how much recycling is happening in La Cruz and the State of Nayarit. 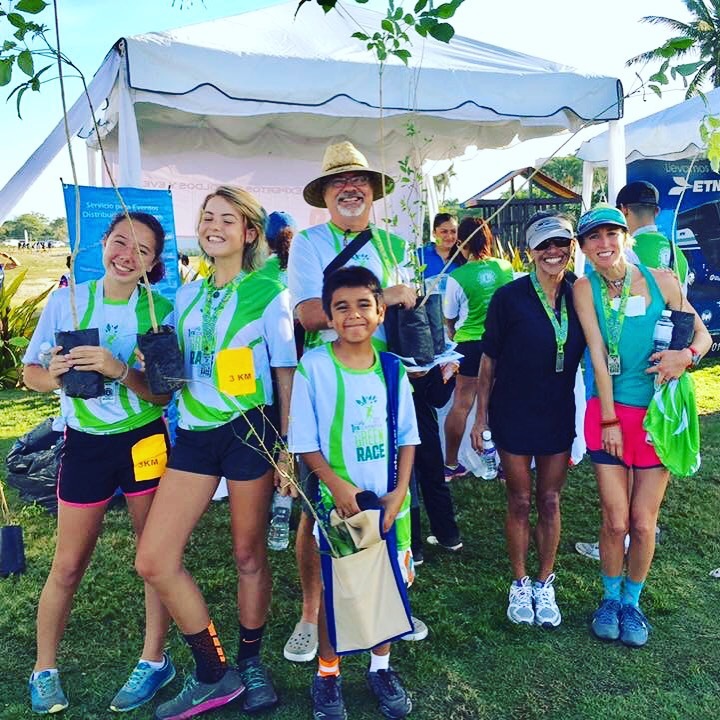 San Pancho is especially promoting “green” living. 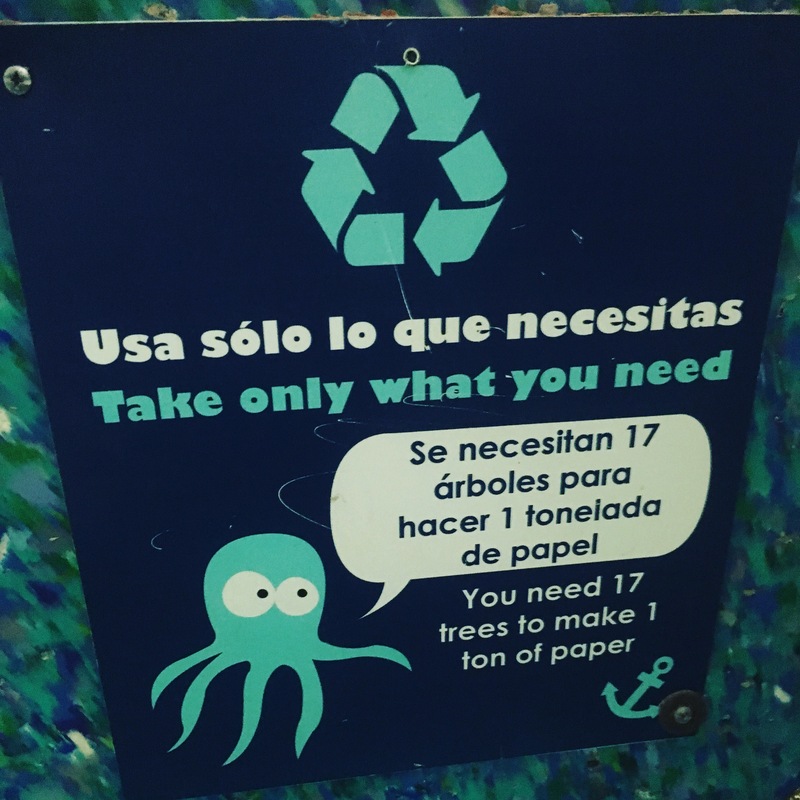 There is still a lot of plastic use and styrofoam, but the effort is here. Bring your own shopping bags and don’t forget to say “sin popete”, this means no straw. One of the biggest polluters are plastic straws. There are reusable straws out there. 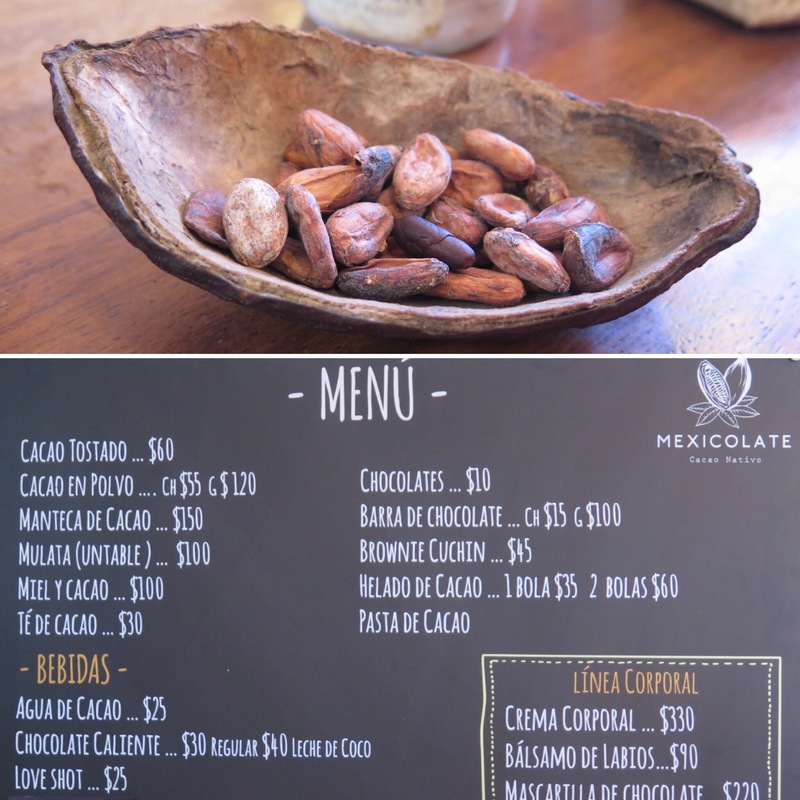 We have a few we that we carry with us for when we order Cocos Frios or Jugos and Liquados. 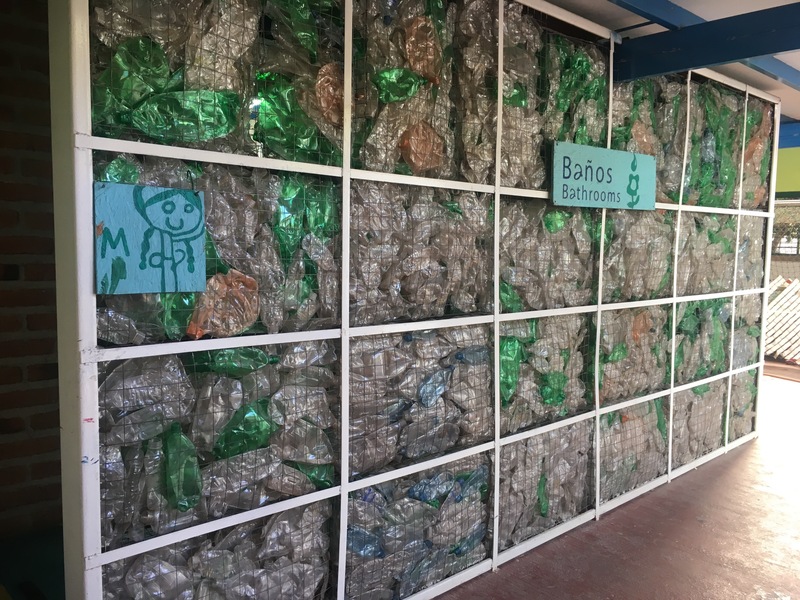 Wall of plastic bottles at San Pancho’s recycling center. 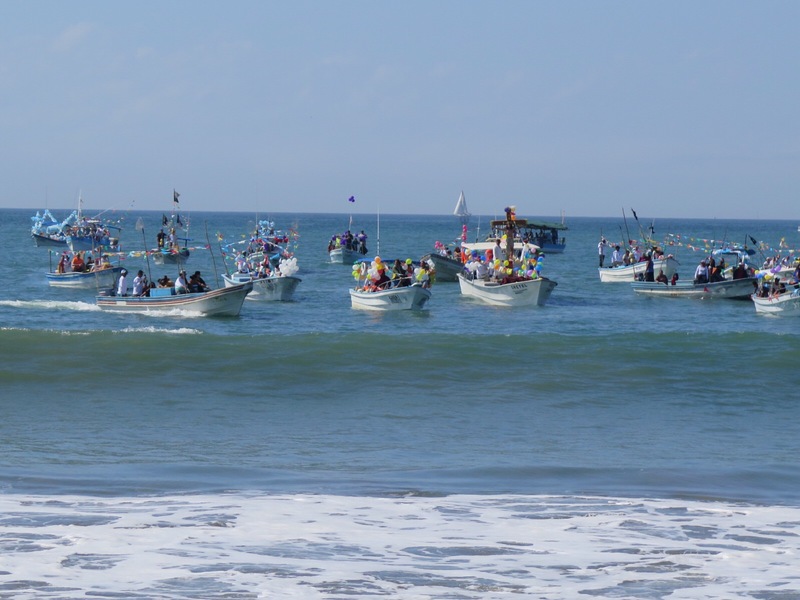 Blessing of the fishing fleet in Bucerias: The fishermen decorate the pangas (boats) and travel from the La Cruz marina to Bucerias, to be blessed by the priest. 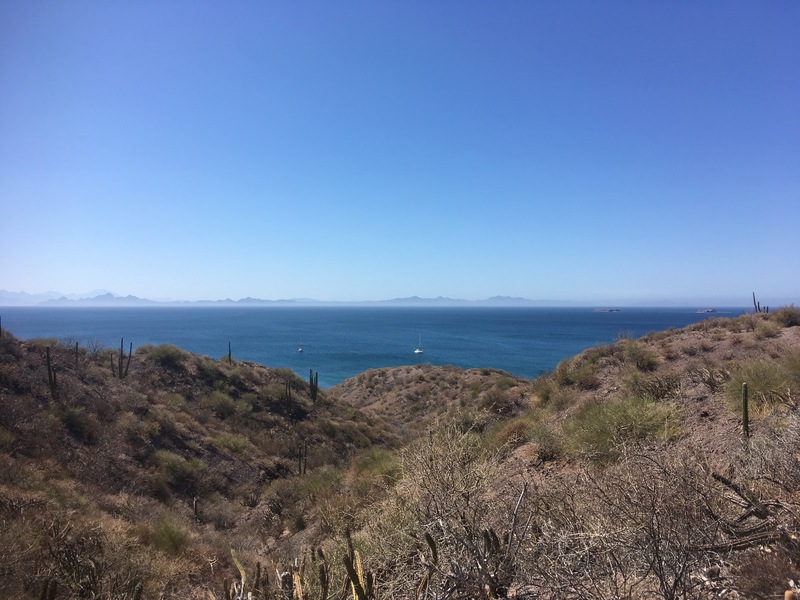 Supposedly the boats form a sign of the cross as they motor over to Bucerias, but that was hard to see from land. 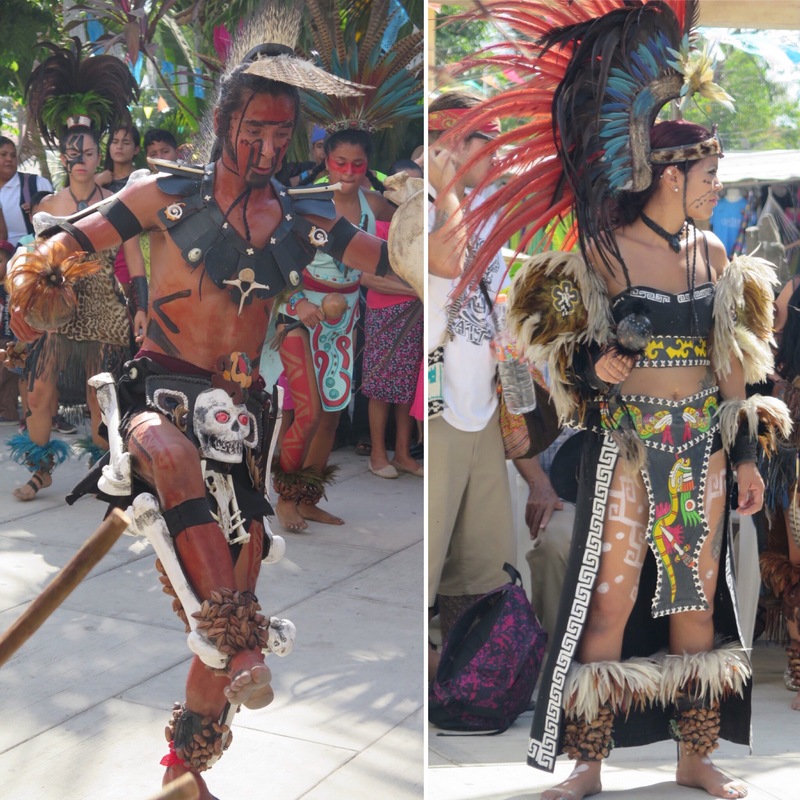 They bring with them, fresh caught fish, fruit, bread, and even tequila to be blessed as well. 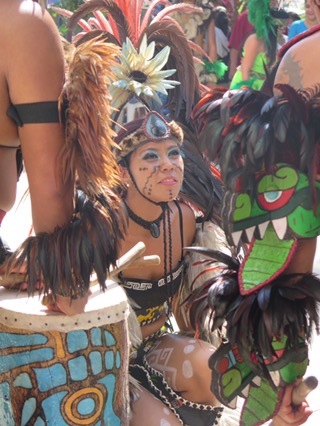 Once they land by beaching the pangas at full speed, they bring theses items to the church for their blessing. 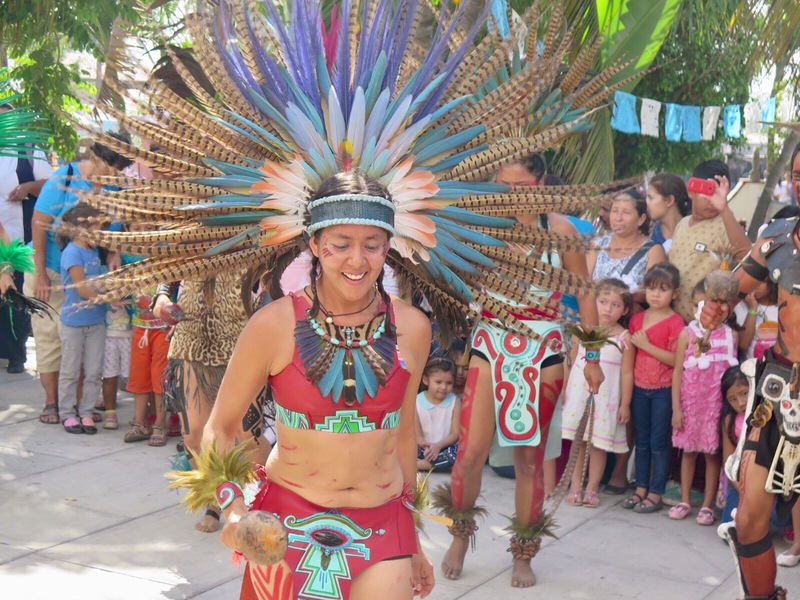 At the church there is native dancing in traditional Mayan dress and song along with Mass. 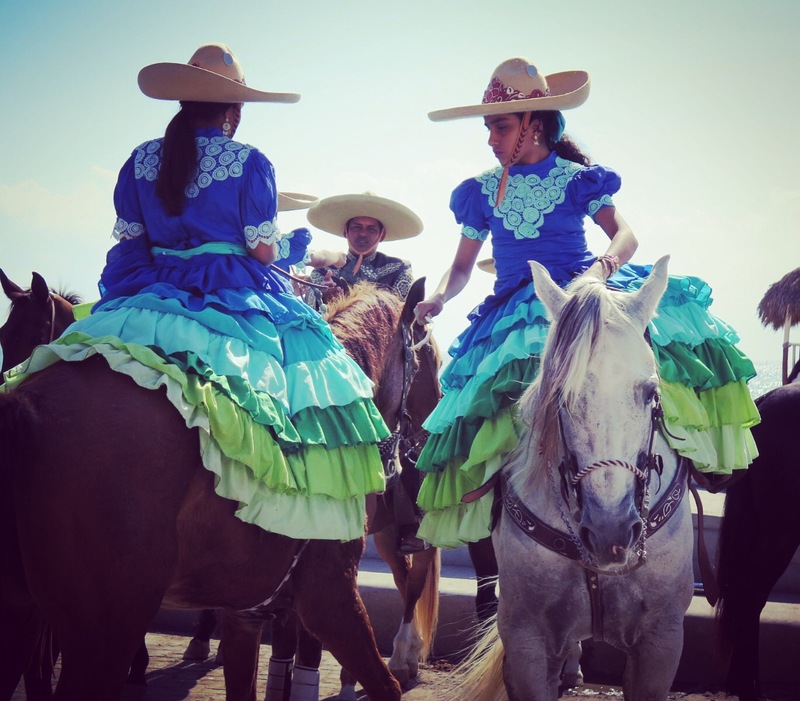 Later in the day, we saw little ladies in fancy dress riding horses side saddle and riders that have their horses dance to live music. 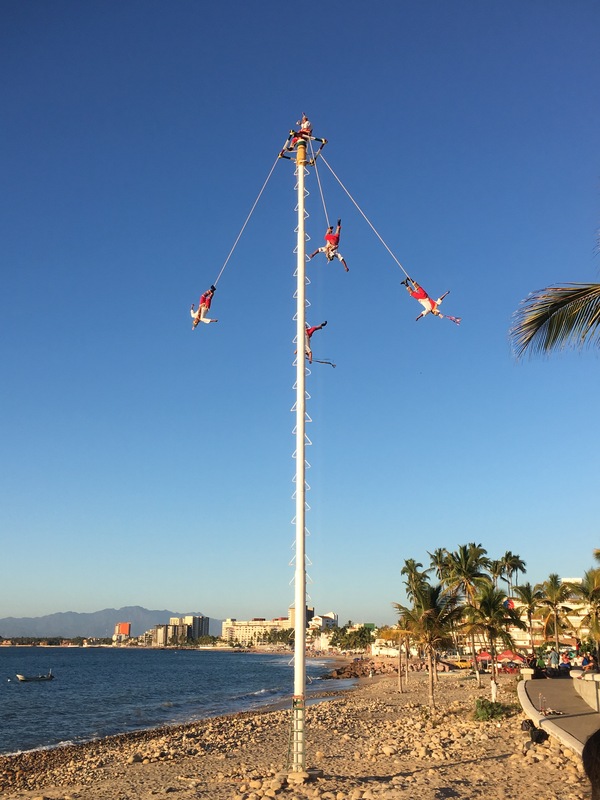 This tradition is done annually to bless the fishermen and their boats for safety for the upcoming year. 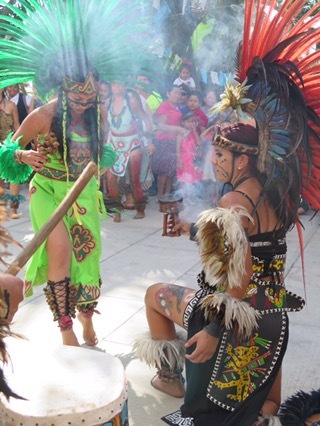 Fairs and Carnivals: we missed the rodeo, but did get to go to the fair in Puerto Vallarta. 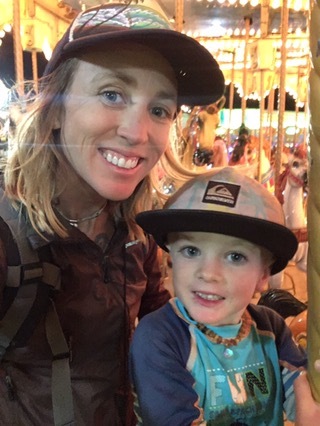 You know you’re in Mexico when your kid is too short for a ride, so you just carry them on and hold them in your lap or right next to you. And when you pay $8/person for unlimited rides. That was a late night for us. 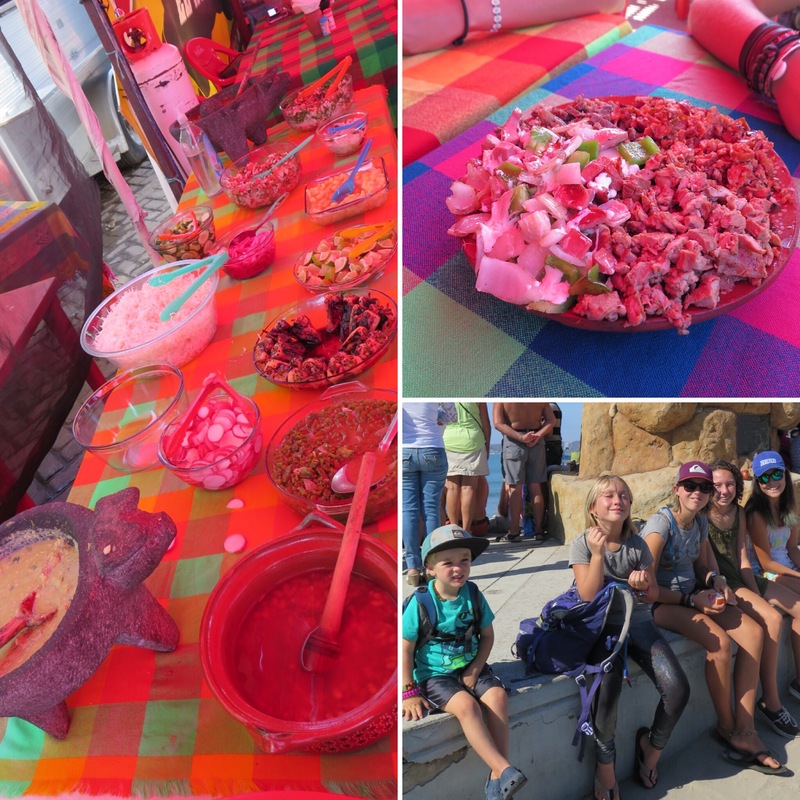 Day trips outside of La Cruz to Yelapa(video), San Pancho, Valle Dorado, down town Puerto Vallarta, Turtle Release(video), local(ish) surf spots, 6 birthdays, talent shows, sailing presentations, etc. We have not ventured inland yet. 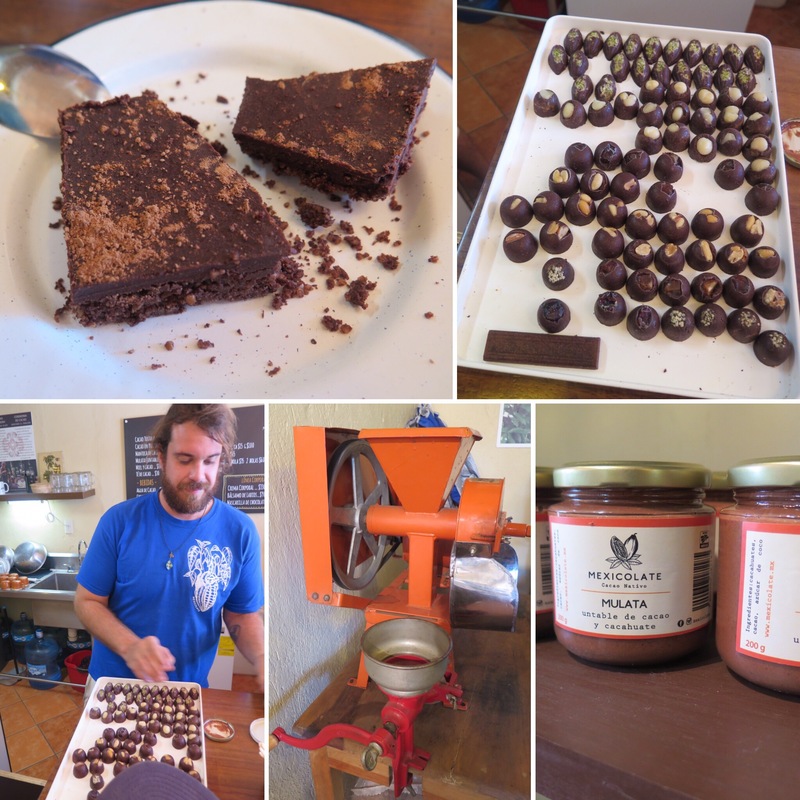 San Pancho with SV Empyrean Our friend’s gourmet raw Chocolate Shop in San Pancho “Mexicolate”. A must for opening your heart. If sweetened at all, they use honey and rarely raw cane sugar. 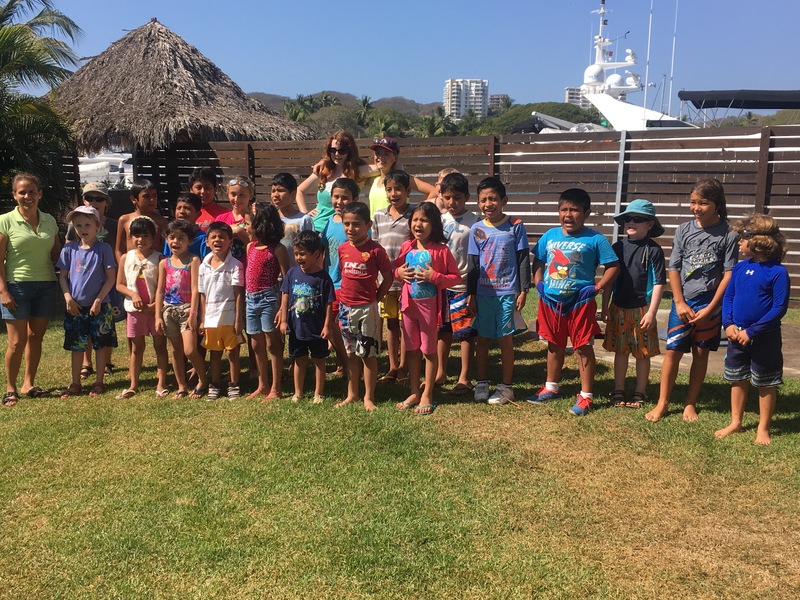 Another orphanage visit to the Marina for some poolside play time with the cruising kids. We aren’t sure what’s next on the agenda. We are waiting for Christian to regain strength and stamina from being sick for so long. He just had 2 wisdom teeth pulled, one that was infected, so hopefully that’s it for him! 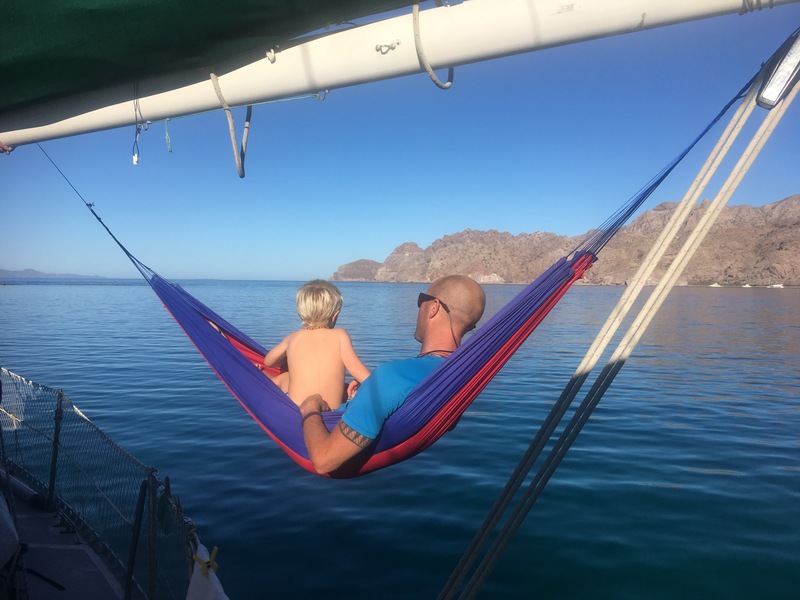 We are hoping to sail south to Barra de Navidad soon before making our way back up in to the Sea Of Cortez again. Yes, another change in plans. We were going to go south toward Ecuador, but health is first in our plans this year. 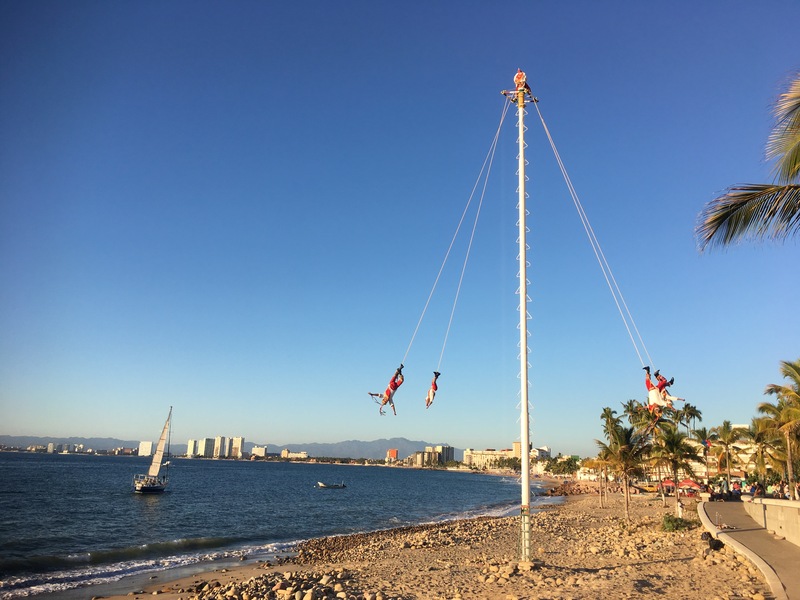 We will be happy just to sail out of Banderas Bay soon. 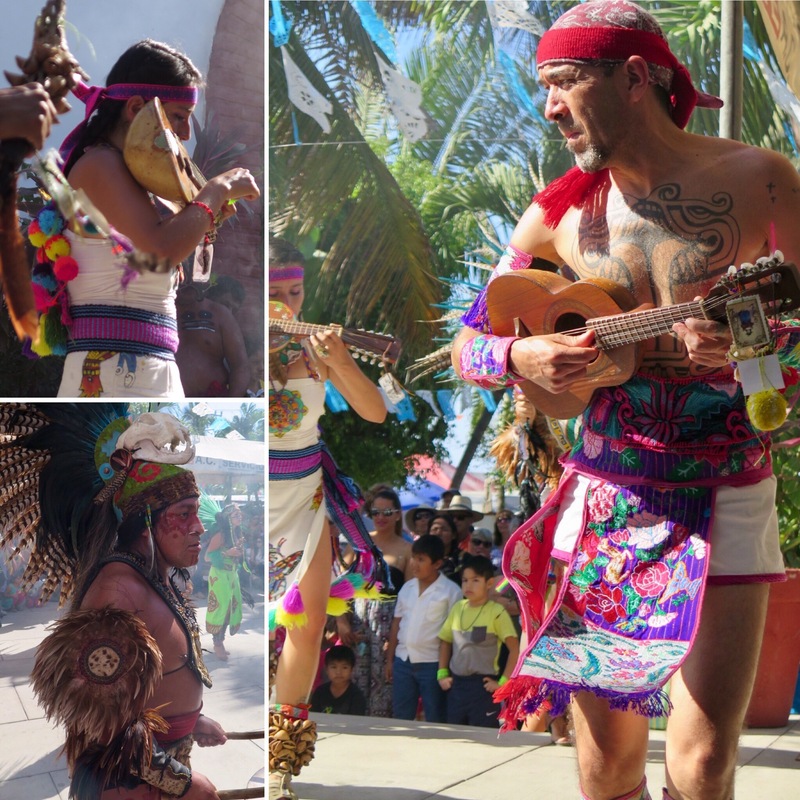 In the meantime, we’ll keep seeking out cultural experiences around La Cruz, hopefully not just the ones to doctor’s appointments. 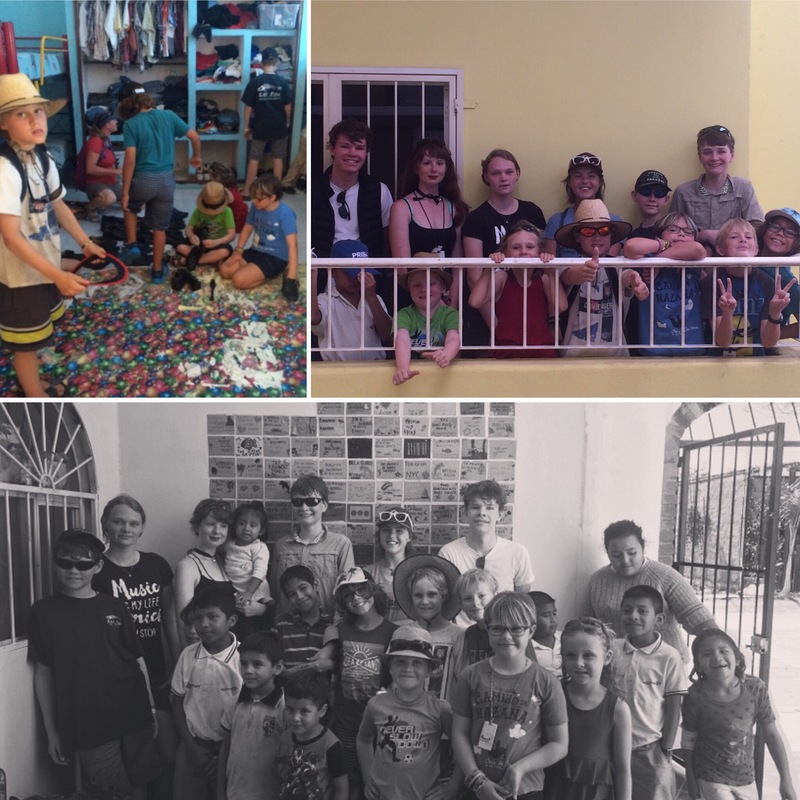 La Cruz Kids Club community service at the orphanage. Kids from the sailboats Ceilydh, Nomi, Pickles, Shawnigan, Velella, and Zimovia. A beautiful family on one of our bus rides. 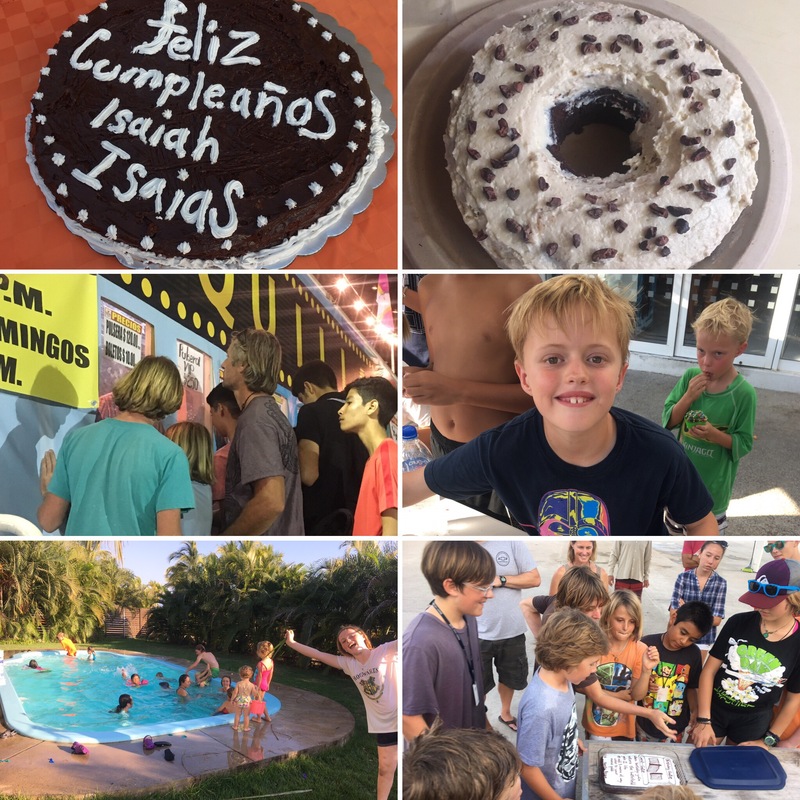 La Cruz Kids Club burgee. 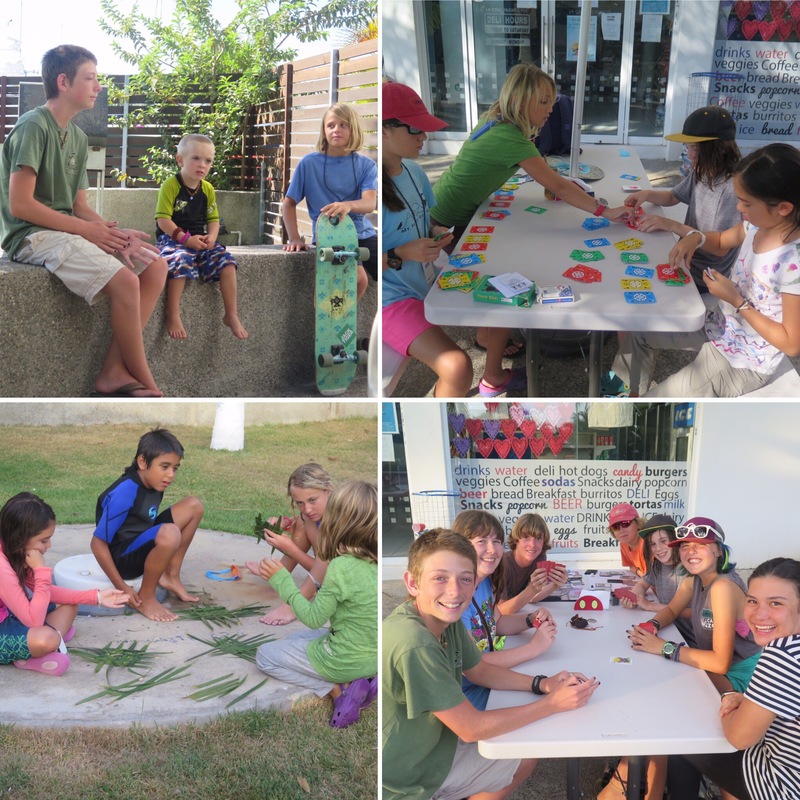 La Cruz poolside deli hangout; cruising kids unite! Sailboat kids from August Dream II, Full Monty, Kenta Anae, Luminesce, Princess Ericka, Raireva, Riki Tiki Tavi, and Shawnigan. 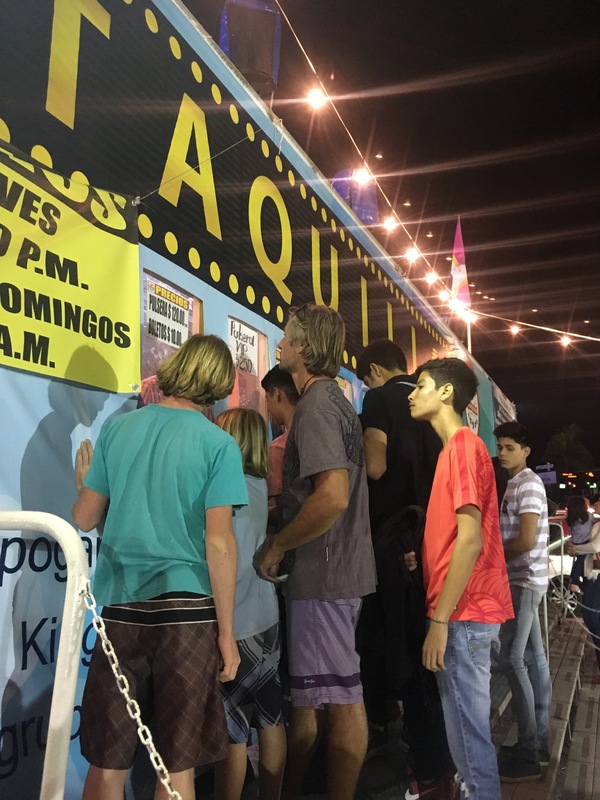 This entry was posted in boatschooling, Cruisers, cruising with kids, cruisingkids, kid boats, kids on boat, sailing family, Sailing with kids and tagged a family afloat, afamilyafloat, banderas bay, blessing of the fishing fleet 2017, blessing of the fleet, boat kids, boatachool, boatlife, bucerias, bucerias orphanage, cruising kids, dental work in mexico, february 2017 mexico, homeschool, january 2017 mexico, kids on boats, la cruz, la cruz cruising kids club, la cruz kids club, marina la cruz, marina nayarit, mayan traditions, mexican bus, mexican culture, mexican orphanage, mexico dental work, puerto vallarta, sailing family, sailing life, sailing mexico, sailing with kids, sparkman&stephens, stevens40, SV August Dream II, SV Ceilydh, SV Full Monty, SV Kenta Anae, SV Luminesce, SV Mango, SV Nomi, SV Pickles, SV Princess Ericka, SV Raireva, SV Riki Tiki Tavi, sv shawnigan, SV Velella, SV Zimovia, temple if guadalupe puerto vallarta, templo de guadalupe, world school on February 9, 2017 by A Family Afloat. Get Trackimo: GPS tracking device for your valuables and maybe your kids too! 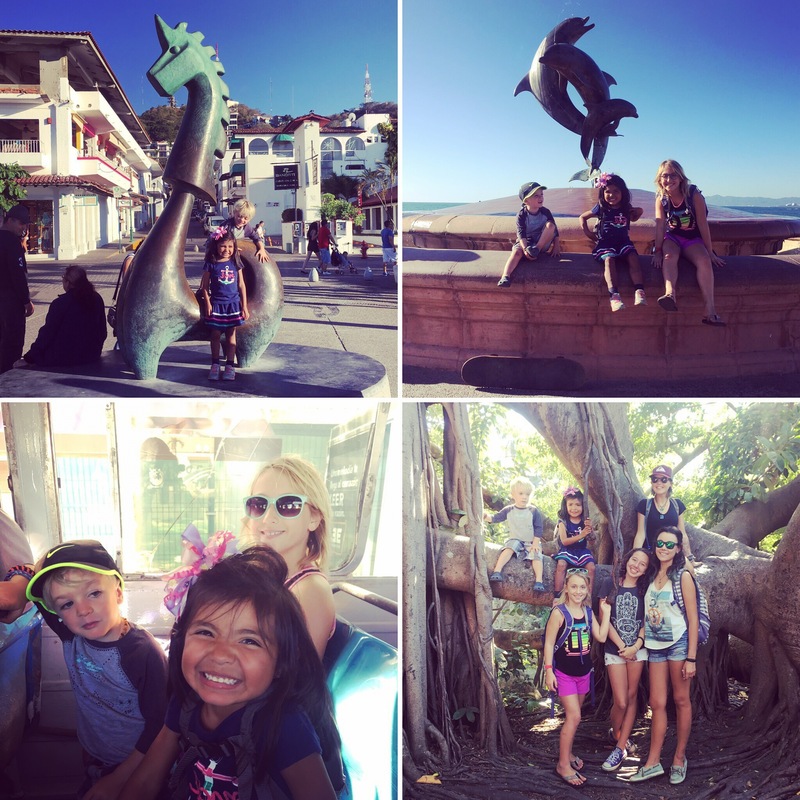 See our Nugget Guides along with many other family vacation activities!